I admit it; I was pretty doubtful about this recipe the first time I tried it. I had some acorn squash from my Bountiful Basket order and I wanted to do something more interesting with it than roasting with brown sugar and maple syrup, so I turned to Pinterest, as usual. 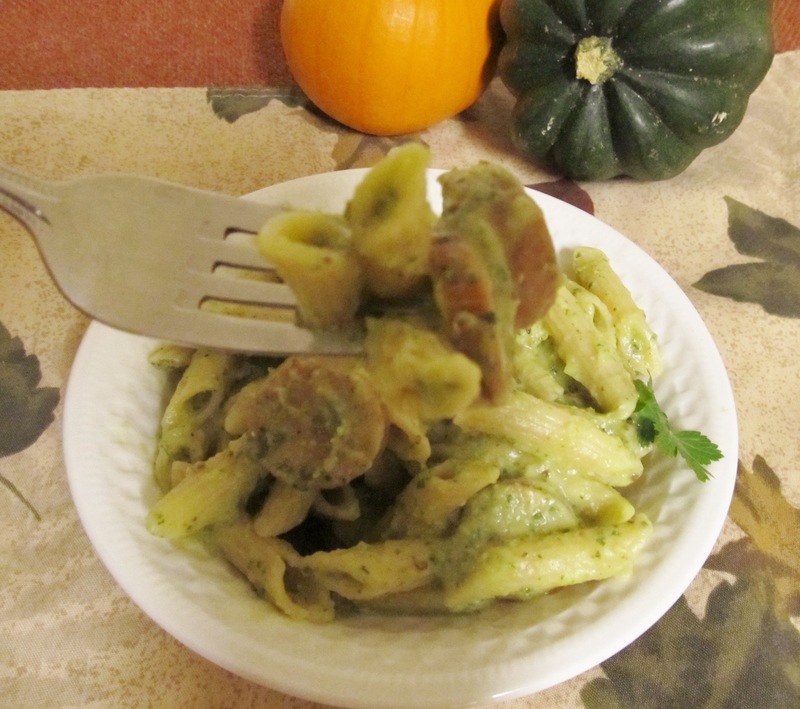 I found some interesting recipes, but since I’m a sucker for pasta dishes, I was drawn to Healthy Happy Life’s recipe for Acorn Squash Vegan Alfredo Sauce. Well, I’m not vegan, but the idea of making pasta sauce from squash sounded fun, so after careful consideration, I decided to give it whirl. I viewed it as an experimental recipe, fully prepared to go to plan B if it didn’t work out. (In our house, plan B is cereal for me and frozen burger patty for the Hubs). The first issue I had with the recipe was that it calls for nutritional yeast flakes. I have no idea what that ingredient is, so I wasn’t sure what to sub for it. In reading through some of the comments on the post, I learned that cheese might be a good substitute, so I decided to try using some Parmesan and asiago cheese, since that’s what I had on hand. I only had vanilla flavored soy milk and worried that the vanilla flavor wouldn’t go well with the savory flavor of the sauce, so I used skim milk instead. Otherwise, I made a few other minor adjustments and the results were truly surprising. 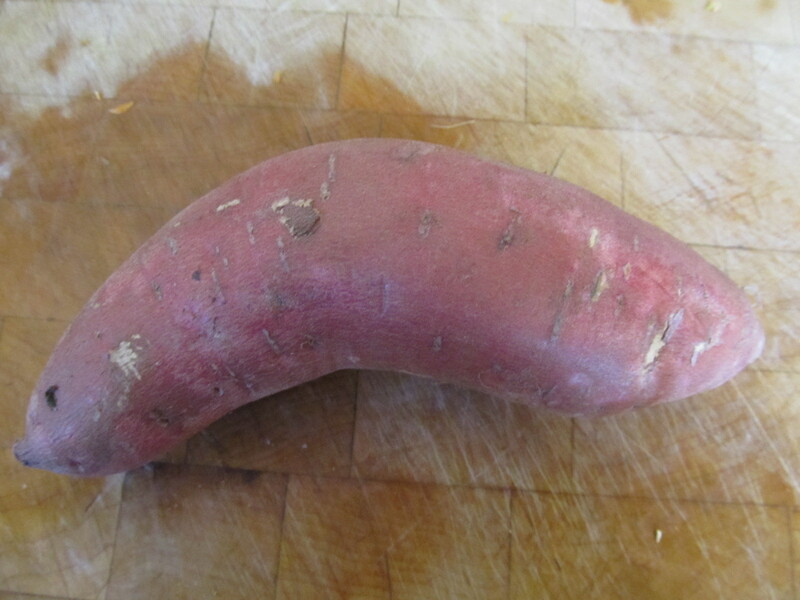 It was creamy and it didn’t taste odd – or squashy. The flavors are deep in their Italian savory roots. It’s not sweet, like you might think, either. I added some cooked chicken breast to the dish, mostly because I was afraid that the Hubs would reject a meatless meal – especially when he found out that the main ingredient was squash. When the Hubs arrived home for dinner, I nonchalantly served up the squash pasta and commenced eating my own, waiting for his reaction. He started eating without asking questions and then said the magic words: “This is really good.” I asked him if he knew what it was. Then he gave me that look – the one that says, “Oh Lord, what has she fed me this time?” I told him the sauce was made from acorn squash and he was pretty surprised and said he really liked it. BUT, the real test came later when a family friend’s 18 year old son dropped by and we offered him dinner, but didn’t tell him what it was, other than pasta. He ate two plates before we told him he was eating squash sauce with the pasta. Didn’t faze him. Kids: you never know. Slice squash in half, horizontally. Place cut side down in a baking dish. Add about an inch of water to the pan. Roast for about an hour, but check for doneness at 45 minutes. The skin peels away easily when it’s done. 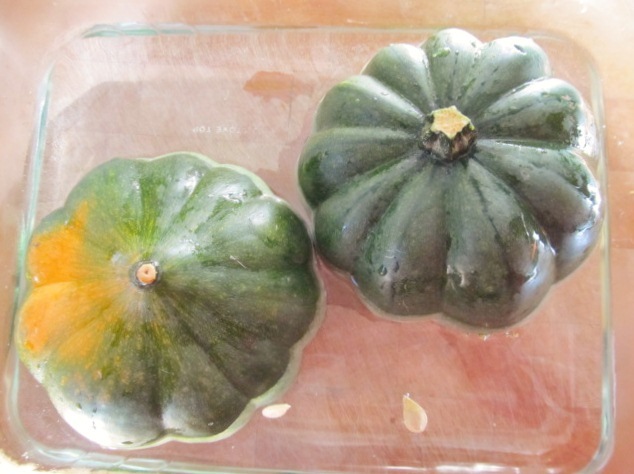 Allow squash to cool enough to handle. Set salted pasta water to boil. Cook pasta to al dente. 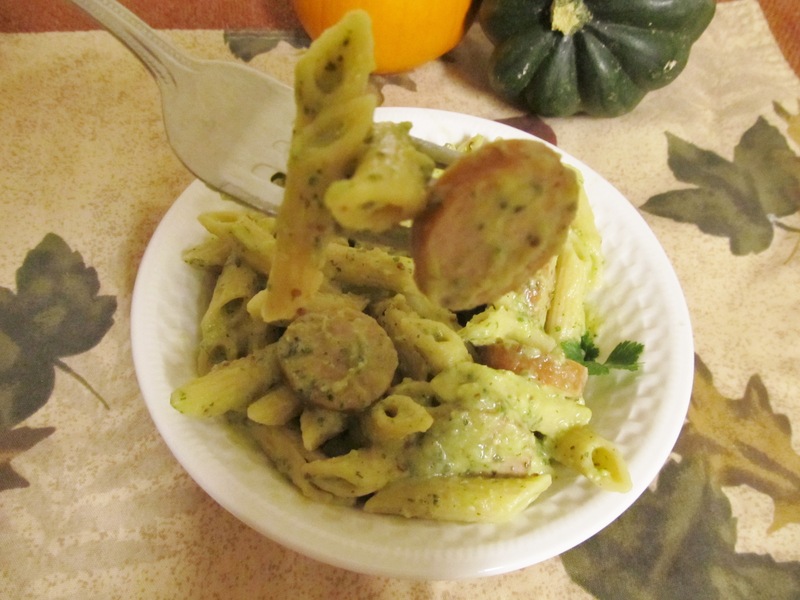 (I also added my sliced chicken sausage to the pot while pasta was cooking). Reserve a cup of pasta water when you drain the pasta, to add to the sauce to thin, as needed. 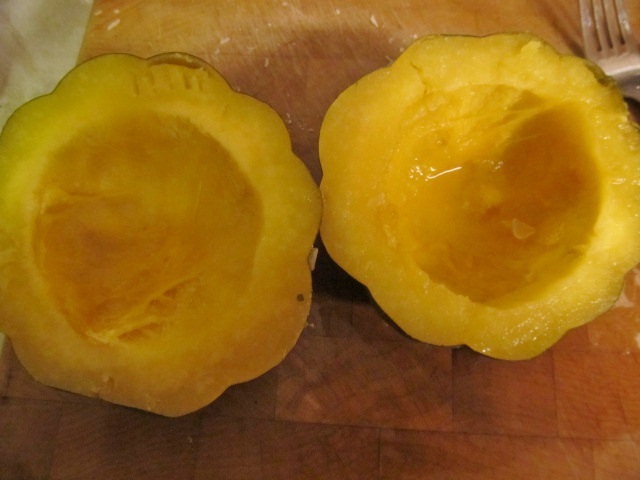 While pasta cooks, remove squash skin and seeds, then place the pulp in the food processor. Add remaining ingredients and blend until all ingredients are creamy. Taste and adjust spices to taste. 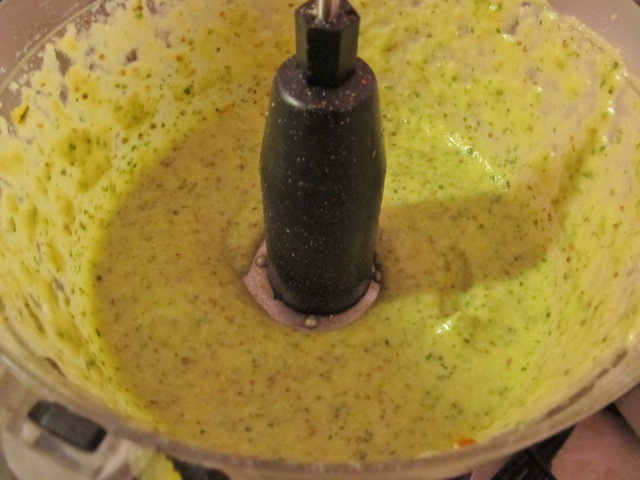 If you need to thin it, add some pasta water a little at a time and blend then check consistency. Toss pasta with sauce. Serve immediately. The first time I made this, I used both parm and asiago cheese and I liked that better than just the parm. Another thought – to make a little more creamier, I think I might add a little Greek yogurt next time. I love shrimp, so I would add some cooked shrimp instead of chicken, but the Hubs doesn’t love shrimp (well, he doesn’t love shrimp touching anything other than deep frying batter and cocktail sauce). Instead of protein, you could also up the veg quotient with some steamed broccoli or some sautéed bell pepper or zucchini. The apple cider vinegar creates a nice tang in the background, but I almost tried some red wine vinegar, instead. I think it goes with Italian better. Finally, I want to add some caramelized onions to the mixture for a little more savoriness. Try this! I bet, like me, you’ll be pleasantly surprised at how much you love it and how different it tastes than you expect. For my other squash pins see my Squash Board on Pinterest. Categories: Cooking, Dinner, Pasta, Vegetarian, Veggies | Tags: autumn, basil, Bountiful Baskets, Cooking, Fall, food, Harvest, healthy, homemade, low-fat, pasta, recipes, squash, Vegetarian | Permalink. Tomato season is ending in most of the U.S. (unless you live in the desert like many of my friends who are now planting their winter gardens! 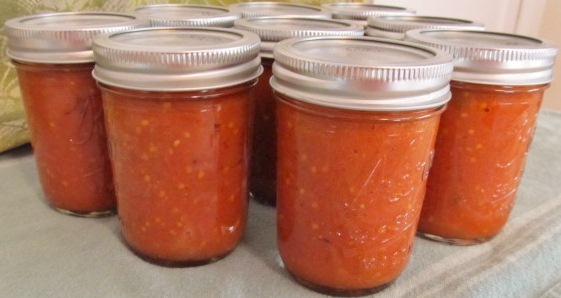 **jealous**), so it’s time to use up the last of the season’s crop of ‘maters.This is a pretty simple, no fuss, no waste way to make some delicious marinara sauce – for dinner tonight and/or to preserve for the winter. 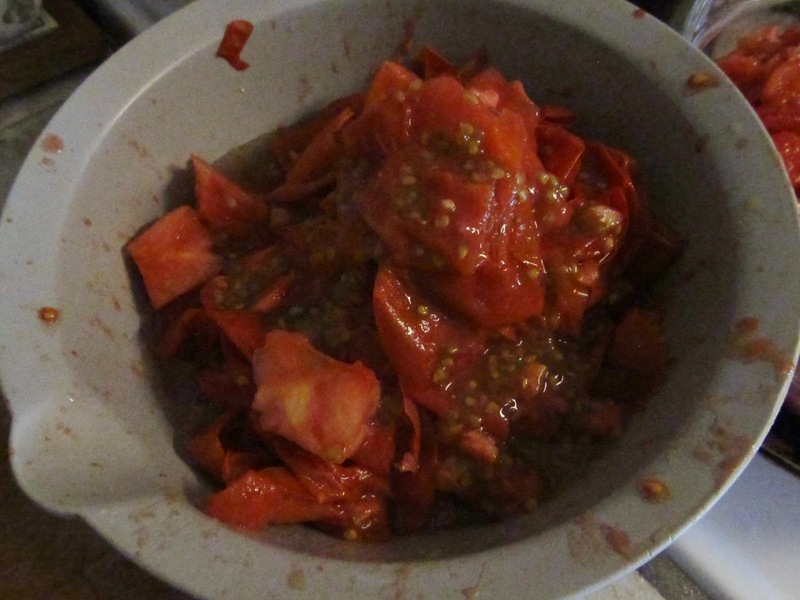 The first time I canned diced tomatoes, I was pretty appalled by the amount of tomato waste I had afterwards. 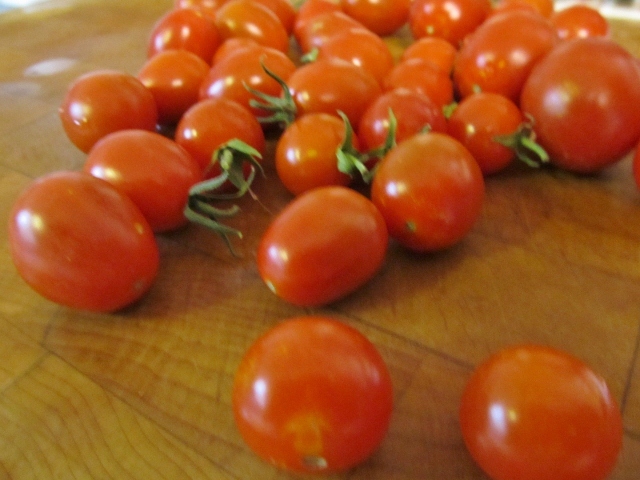 By the time you skin and seed the tomatoes, you end up with bowl o’ leftover tomato parts. While I was ok with composting my waste, it seemed silly (and also ironic) to have grown all of those tomatoes, only to waste so much of them in the preserving process. I felt like I was burying my children in the compost pile (cue dramatic music). I went on a search for recipes to use the rest of the tomato parts, so I wouldn’t have to loose so much in my future processing. I found recipes for paste, juice, etc. 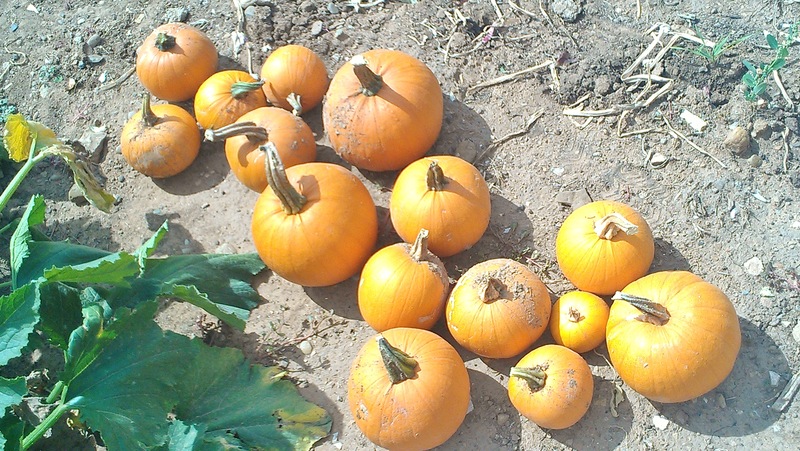 and plan to try some of those next year when I have a larger crop. But, the one that struck me as oh so simple and also so obvious is this recipe for Fresh Tomato Basil Marinara Sauce on The Whole Life Nutrition Kitchen, a blog I love. Ali and Tom, the authors, keep it simple with their recipe and I love simplicity. I followed their recipe, but only made half a batch because I had about 10 pounds of tomatoes, so this is the recipe for the half batch version of their recipe. Note that while I usually tell you not to be fussy about ingredient amounts, if you are going to can this recipe, as I did, you really need to stick to the recipe for food safety purposes. However, if you’re going to eat it tonight and freeze any leftovers, feel free to play around with the ingredients to your personal tastes. * Because I made this sauce on a super-harvest-preserving kitchen day and had many projects going on at once, I didn’t photo-document the whole process this time. 1. Heat a large stockpot over medium heat. Add the olive oil and then the minced onions and garlic. Saute for about 10 minutes. 2. Remove the stem-end of the tomatoes (this is the only waste and I put mine in my homemade veg stock storage in the freezer). Process some of them in a food processor, leaving them a little chunky. Blend the remaining tomatoes until smooth. 3. 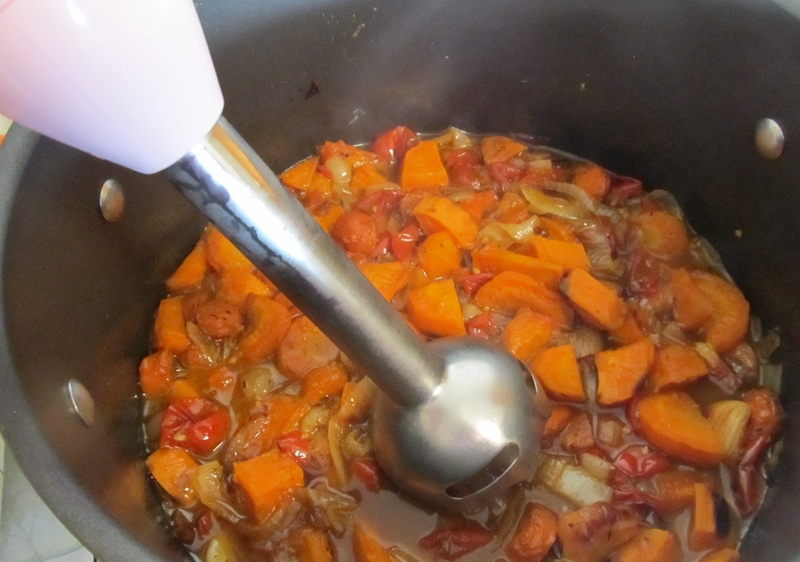 Then begin to add the tomatoes to the pot of onions in batches as you puree them. (Don’t be alarmed if your tomato mixture looks more pink than red at this stage. 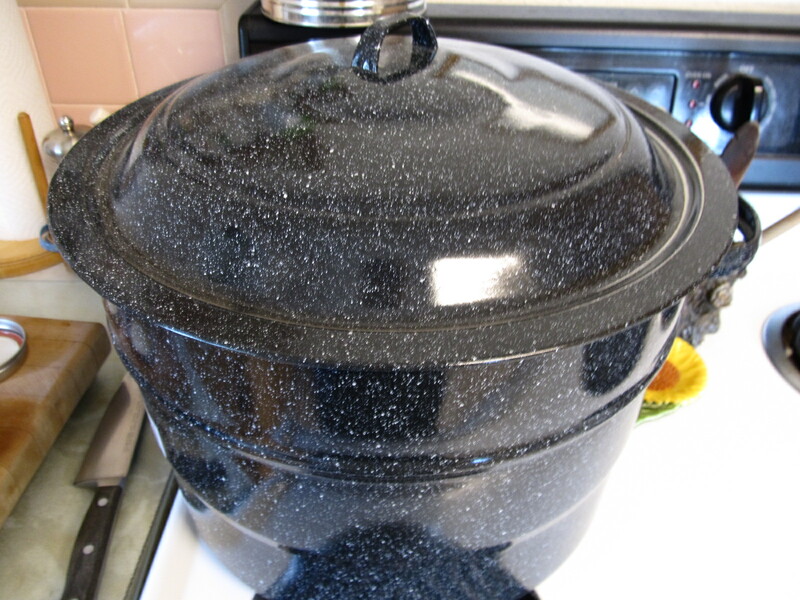 The color darkens as it simmers). 4. Add the chopped basil, vinegar, sugar, Italian seasoning, and sea salt. 5. Cook, uncovered, for about 3 hours or until sauce has cooked down and thickened. Be sure to stir it on occasion and keep it on a rapid simmer. 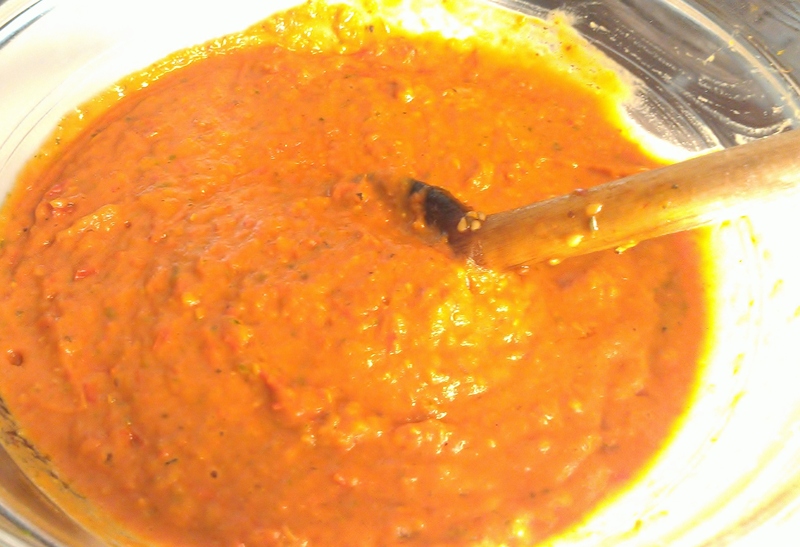 Keep cooking until sauce has thickened to your liking (my smaller batch was ready in about two hours). 6. Taste and add more salt if needed. 7. 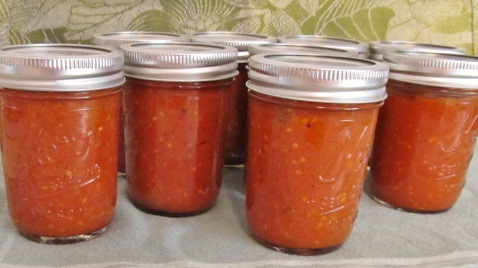 If you are going to can the sauce, prep your jars and lids, according to accepted rules for sterilization. I waterbath canned mine and I use The Ball Blue Book for a reference. See their Intro to Canning article for safe water bath canning techniques. Be sure to add a 1/2 Tbsp of lemon juice to each 1/2 pint jar (1 Tbsp for quarts) before processing. Process your jars according to the timing chart for your altitude on page 6. 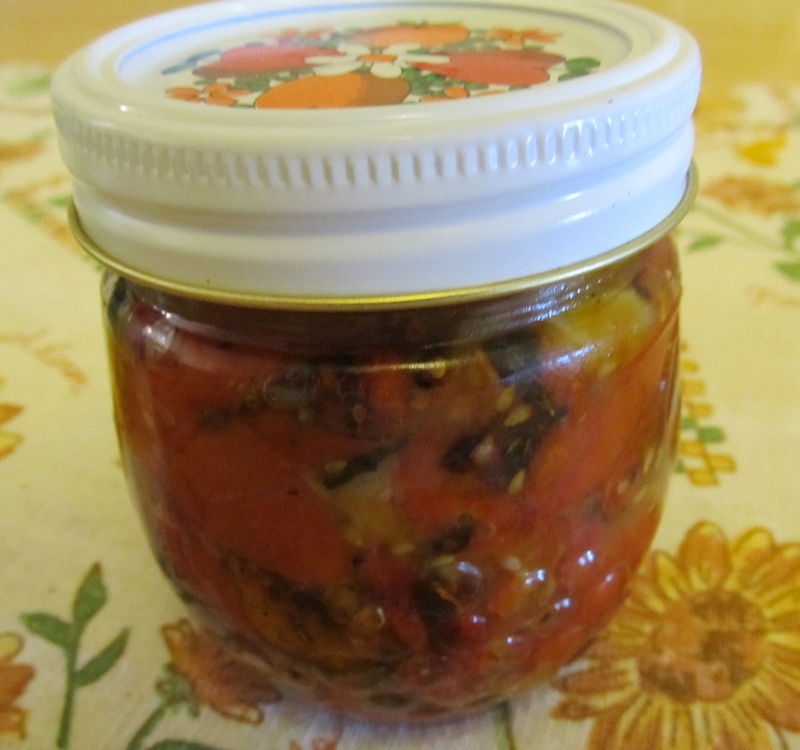 I chose to can my sauce in half-pint jars because I felt that the smaller quantities fit our two-person household better, but you may prefer to use quarts, especially if you make a larger batch. SAUCE! This is a very tasty sauce that the whole family will really love. You will never notice that the skins and seeds have been left intact because they are obliterated in the blending process and then cooked down and softened during the simmering process. I also heard that the seeds are the most nutritious part of the tomato, housing tons of vitamin C, so this sauce must be more healthy than the non-skin-and-seed variety, right? The picky-eater-daughter, who doesn’t like chunks of onions and such, fully approved and took a jar home to her new apartment and later commented that she needs a larger jar in the future. Note taken. 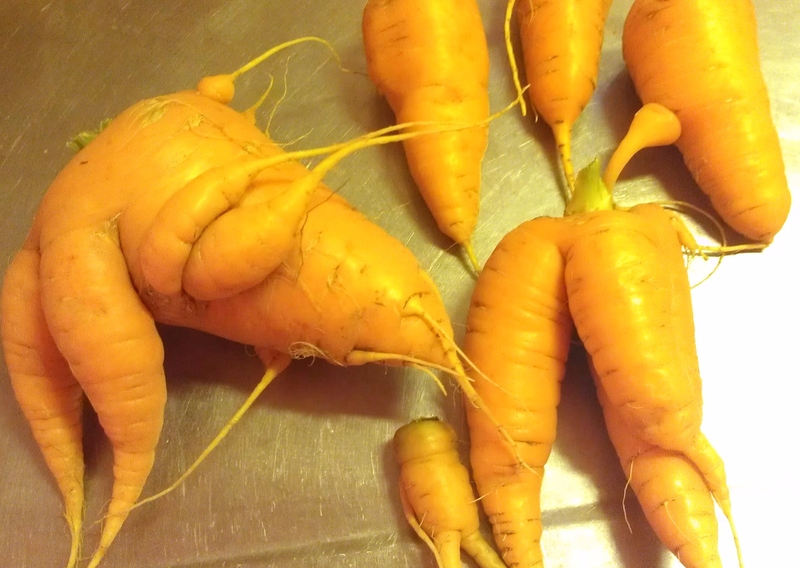 Now, what to make with this great sauce? Pasta is the obvious choice, but I have also used it as a pizza sauce and I keep a jar in the fridge, ready to throw a dollop of it in whatever skillet or casserole dish I might be cooking. Since I adore all tomato saucy recipes, you can bet that my little stash of sauce will not last until Christmas. 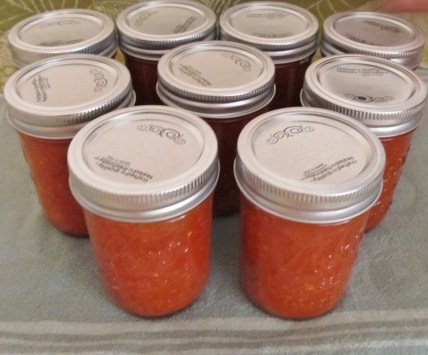 Categories: Canning, Cooking, Preserving, Veggies | Tags: Canning Tomatoes, Cooking, easy, Fresh, Garden, Harvest, healthy, homemade, Marinara, preserving, sauce, simple, tomatoes, Vegetarian | Permalink. 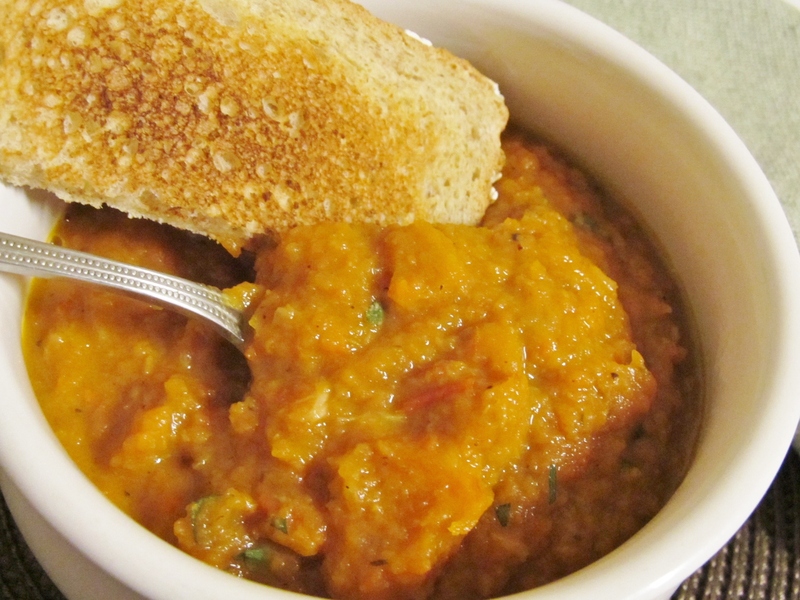 Like so many other cooks, I’m totally obsessed with pumpkin recipes right now. 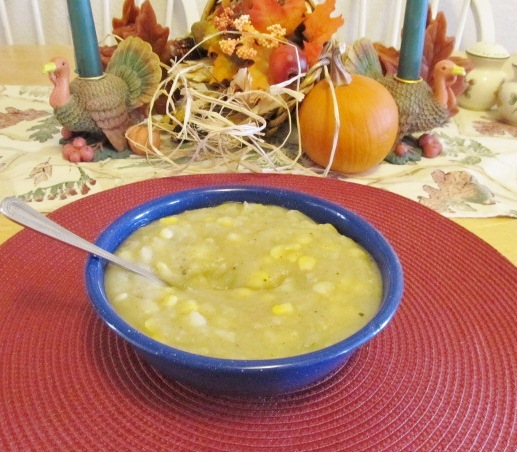 The air is crispy, the pumpkins are frosty and ripe and it’s time for comfort food. Enter pumpkin soup. To some, pumpkin soup sounds odd because they are thinking it will be like pumpkin pie in bowl, but the soup is savory instead of sweet, so it’s a totally different place in flavor-town. The pumpkin takes on the other flavors – the curry and tomatoes, in this case – and provides a creamy background for the other ingredients. I first tried pumpkin soup last winter when I was home alone because I wasn’t sure what to expect. It was delicious! 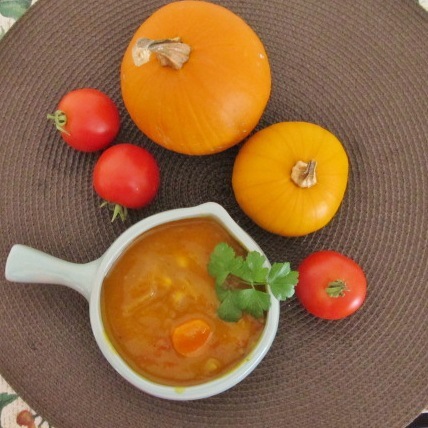 Now that I have my own crop of pumpkins, I wanted to try some more pumpkin soup and play around with some new flavors. 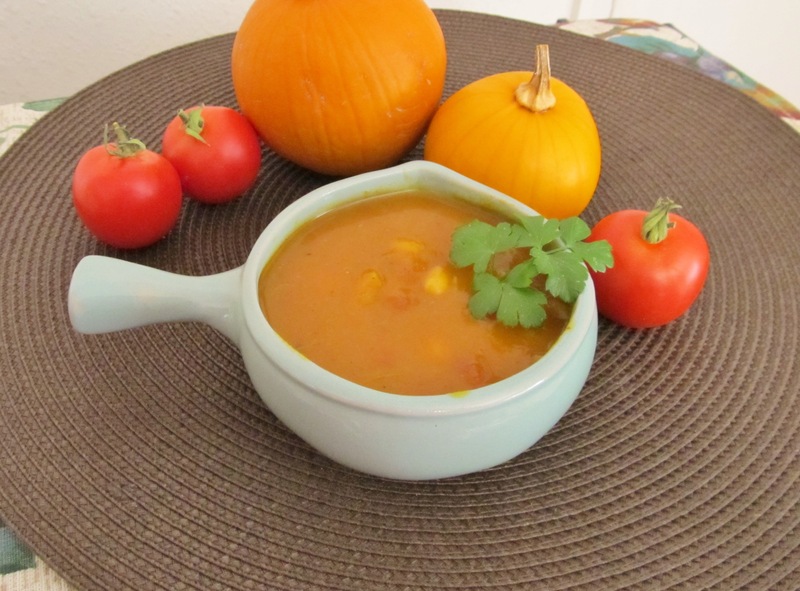 One night last week, I had planned to make this beautiful Curried Pumpkin Lentil Soup that I found on Pinterest. I liked the combination of ingredients which includes coconut milk, lentils, curry, apple and of course the star of the show: pumpkin. When I make soup for dinner I try to be mindful that the Hubs needs something pretty hearty after a hard day working outside. 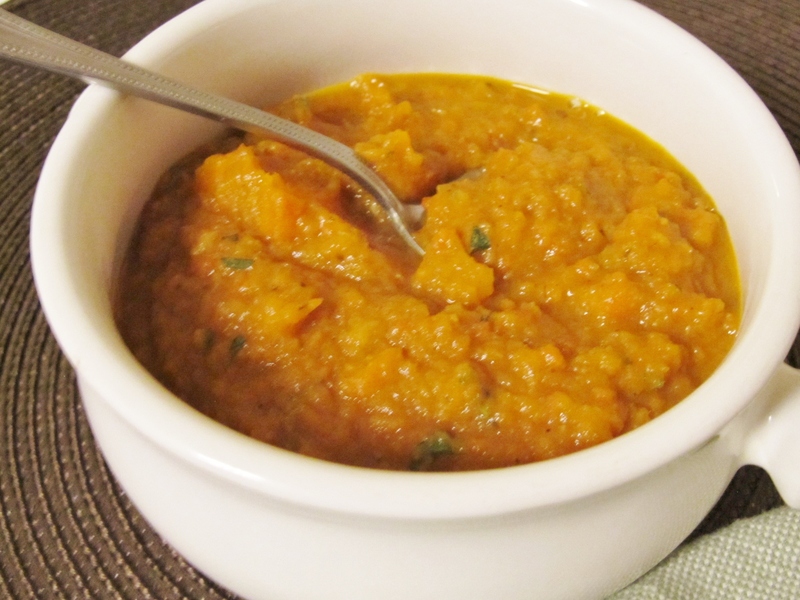 I figured the lentils would up the heartiness, so I was all set to recreate Yummy Mummy’s soup. Then…I don’t know what happened, but the evening somehow got away from me (and I might have had an extra glass of wine with my BFF), so it was getting late and I hadn’t started the soup. In my experience, lentils always take longer to cook than the recipe says, so the hour I needed to make the soup was way too long. What to do? I decided to go ahead with the soup, but make it quicker by skipping the lentils and subbing white beans and making some other simplifications. 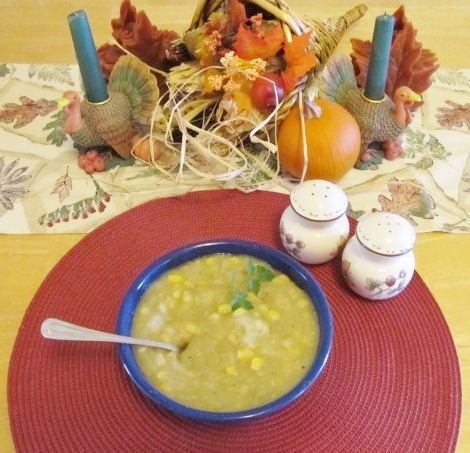 It came together really quickly and the Hubs said it was one of my best soups – and he usually likes all of the soups. Because I was in a rush, I didn’t take pictures as I was cooking, but since it turned out so nicely, I did get pictures of the finished product so I could share with you. 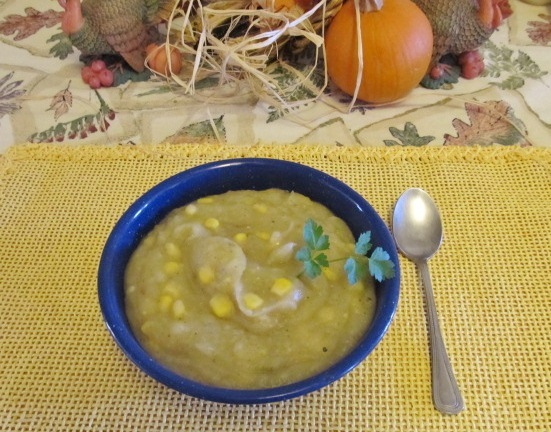 You must make this simple comforting soup this Fall. Heat dutch over over medium heat. Drizzle EVOO to mostly cover bottom of pan and allow to warm. 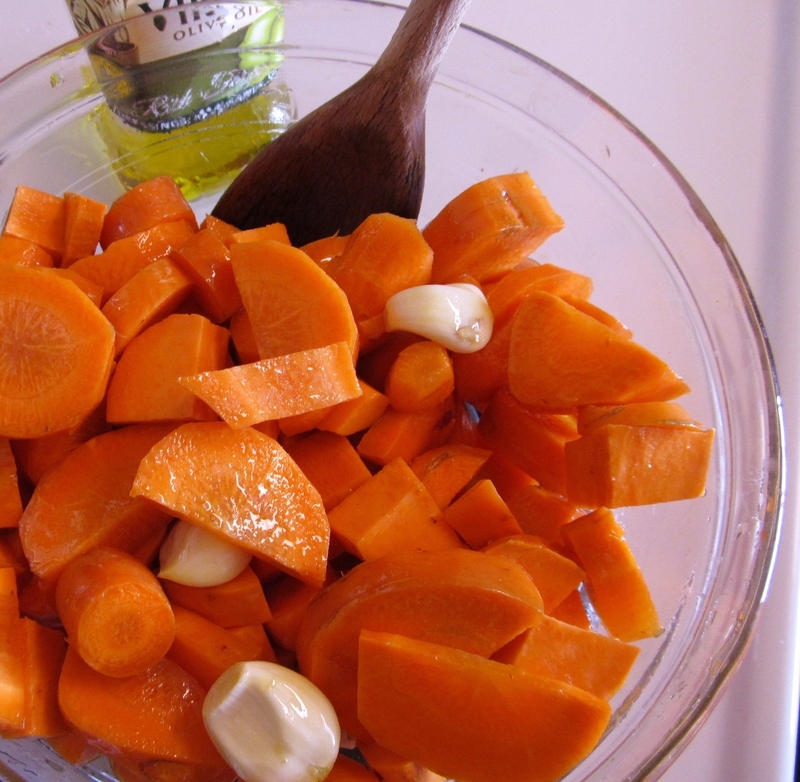 Add carrots and onions and saute until onions soften. Add garlic and cook for about a minute. 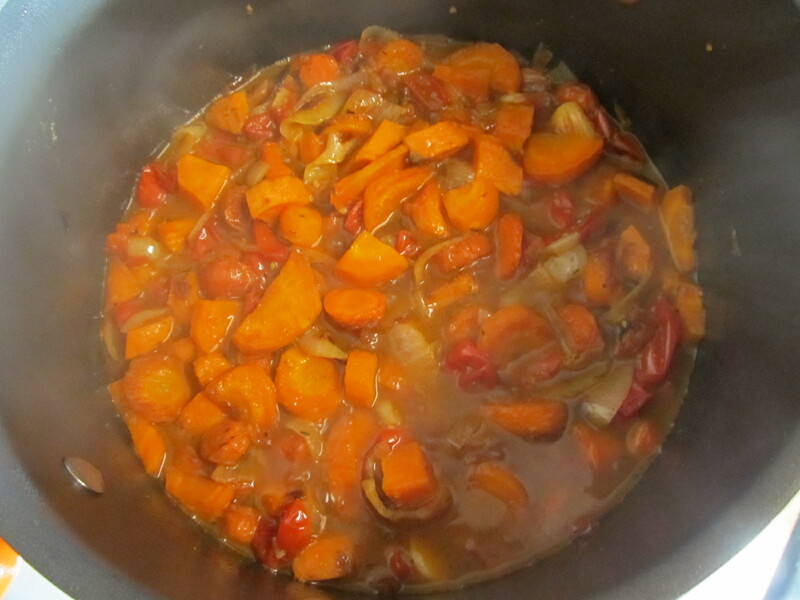 Stir in 4 cups stock/broth, pumpkin, tomatoes, curry and paprika, and salt and pepper. 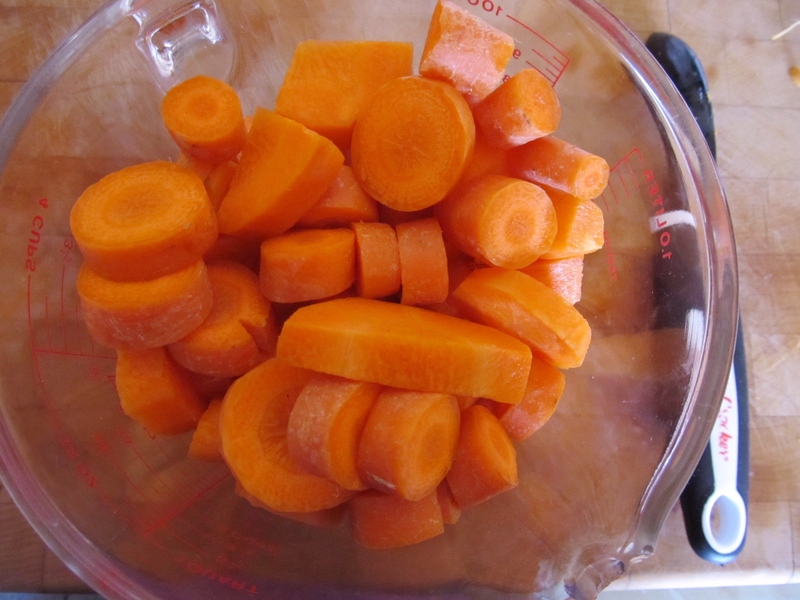 Bring to a low boil and simmer for about 10-15 minutes, until carrots are cooked through. Add beans (and spinach if using) to soup and add remaining stock/broth as needed to thin to desired consistency. Simmer for at least five more minutes. Garnish to taste: parsley, cilantro, or green onions – or sour cream – or nuts or pumpkin seeds. I used green onions and parsley. I didn’t use the spinach this time – I thought of it afterwards and wished I had included it because I love spinach in fresh soup. You could always add some diced, cooked chicken or ham to make it even heartier. Other veggies I might add: zucchini, bell peppers, potatoes, celery or eggplant. 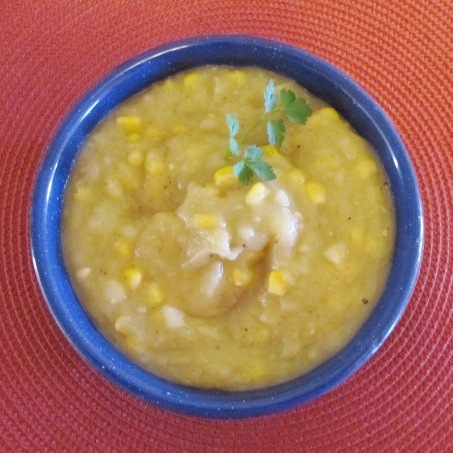 I also want to try the apple and coconut milk from the lentil recipe. Other spices that might be fun: cinnamon, nutmeg or basil. I usually add a glug of Worcestershire sauce to soup, but forgot this time, so I might try that next time, too. 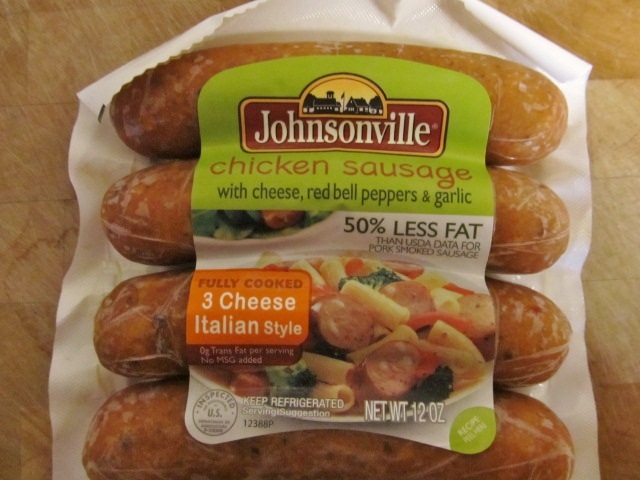 This makes a great lunch the next day since the flavors improve with time. 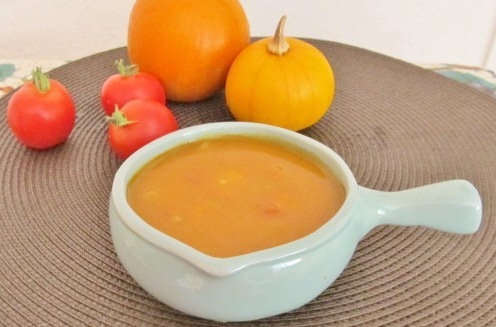 Leave a comment letting me know how your pumpkin soup turns out! Categories: Cooking, Dinner, Soup | Tags: autumn, carrots, Cooking, curry, easy, Fall, food, Fresh, Harvest, healthy, low-fat, pumpkins, recipes, soup, vegetables, Vegetarian | Permalink. 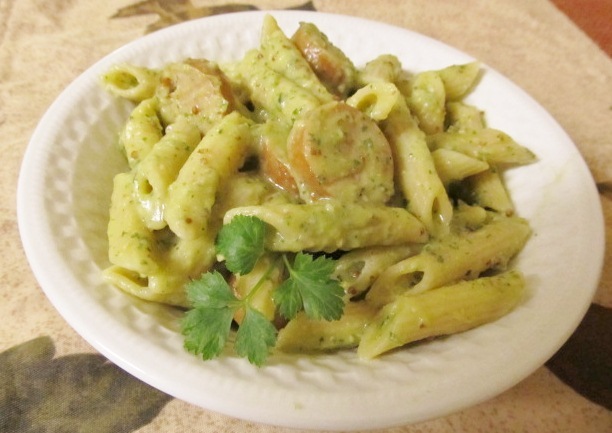 I’ve been telling you that I would share my all time favorite pasta and today is the day! This stuff is like crack for me and I don’t care if you think you don’t like eggplant or have never tried eggplant, just trust me: this is the most sumptuous dish I have come across in a very long time (and I surf Pinterest multiple times a day and I cook every day!). Before we go any further, let’s give credit where it’s due. I only slightly adapted my version from Alexandra’s Kitchen (her recipes are gorgeous, go see them) and she borrowed it from the classic Chez Panisse Vegetables. While I usually fiddle with recipes to suit my own tastes, this one required almost no modifications. Next, let’s address the eggplant issue. I know, most people don’t get giddy over it, but they should! I didn’t plan to grow it in my garden this year, but I had some free space and the local nursery had some plants on sale, so I bought three eggplant plants. I had no idea how beautiful the plants would be…or how prolific. The joke about how everyone leaves zucchini on your porch or in your car at this time of year could apply to eggplant if more people grew it. I had beautiful, shiny purple orbs coming out of my ears, so I went a-searchin for some recipes and I was so lucky to find this one! Then we have beautiful purple fruit! 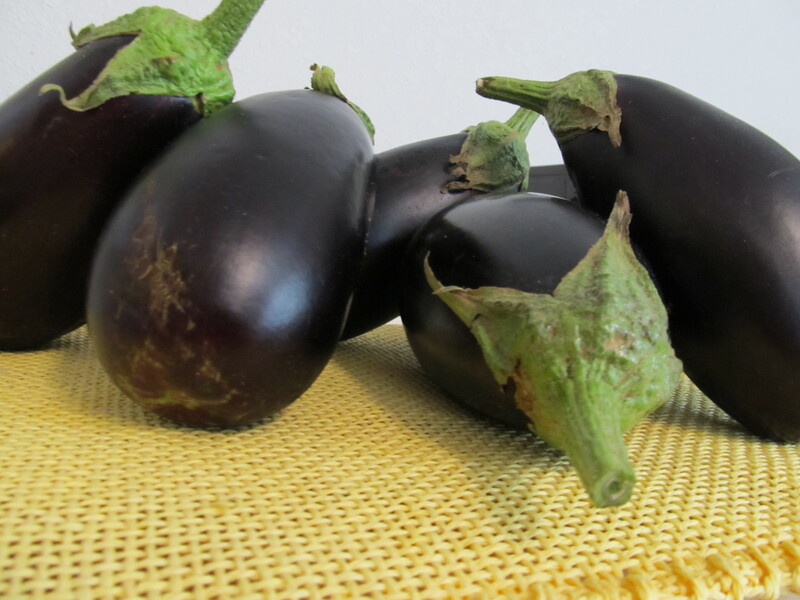 If you don’t have eggplant in your garden (and you probably don’t), you can find it at the farmer’s markets at this time of year and your local CSA or Bountiful Baskets may be including it in their distribution. 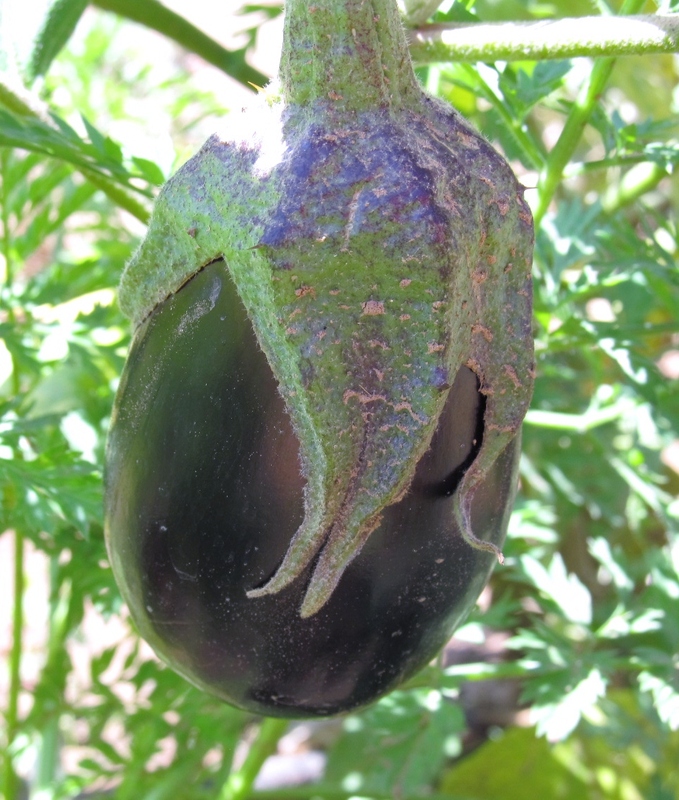 You know that the eggplant is ready to eat when the skin is shiny and fairly firm (with some give), but not hard. Bigger is not better as they can get bitter if they’re too big. Since eggplant can be bitter, we need to do a little prep work. I found that my super fresh from the garden eggplants were not bitter, but if you’re not sure, it’s best to go ahead and do this step. 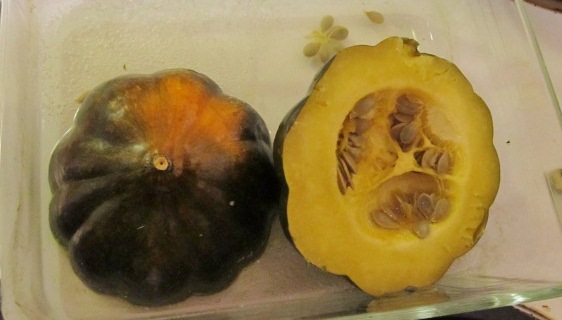 Remove the skin and slice the eggplant into planks about 1/2″ think. Lay on a double layered paper towel or kitchen towel and generously salt both sides. I am no chemistry buff, but apparently this helps leech out the bitterness. Leave them sitting for about 15 minutes, then flip. You’ll see moisture leaking out – that’s the bitterness. Leave another 15 minutes, then wipe off as much salt as possible. Some say to rinse and dry, but I think the residual moisture will impede the roasting process we’re about to use. Salt both sides, then lay out to rest for 30 minutes, flipping halfway through. Next, dice it up, and throw it on a baking sheet – NO olive oil this time – and roast at 400 degrees for 20-30 minutes, until softened and golden brown. Some people think that cooked eggplant is slimy. Complete MYTH. Let it cool and taste it now. Nothing slimy about it, right? 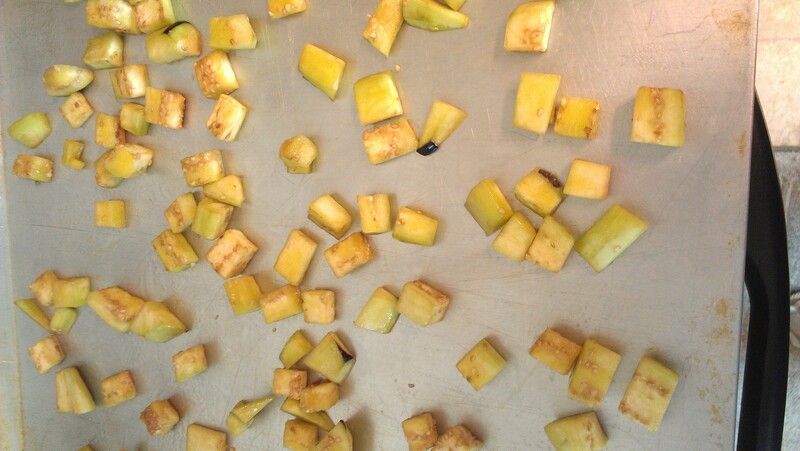 Roast diced eggplant at 400 for 20-30 minutes until tender and golden brown. At this point, you have a choice to make. It’s about the tomatoes. Alexandra’s recipe calls for two cups of tomato sauce. When I made it the first time, I didn’t have any sauce and I was feeling a little lazy and didn’t want to make any (and I won’t buy it), so I dug around in the cupboard and found a can of fire-roasted diced tomatoes and used that for the sauce (adding a dollop of pesto). You can do the same and it will be amazing – I fell in love with it this way. BUT, if you want to go more homegrown, and use up some of those cherry tomatoes, go ahead and make a pan of roasted cherry tomatoes at the same time the eggplant is roasting. Beware, people may knock on your door, fork in hand, because they will smell all of this deliciousness wafting from the windows. 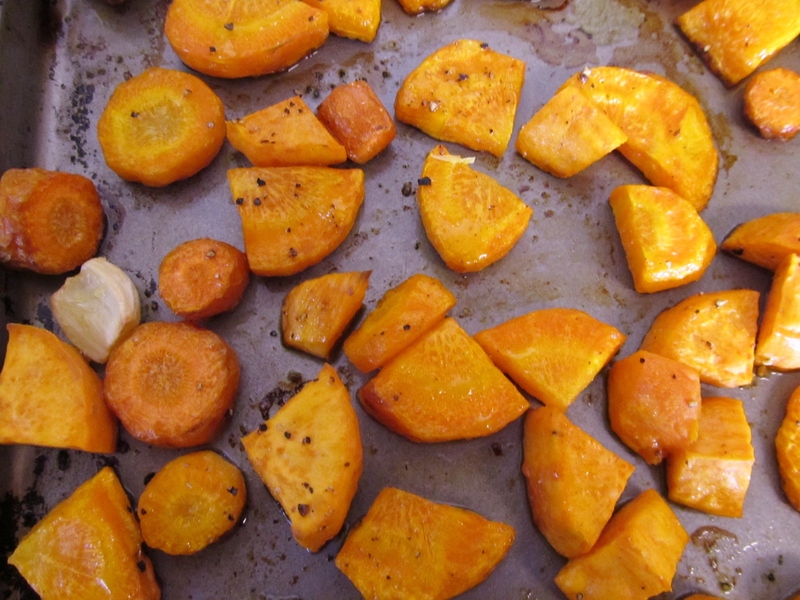 Caramelize an onion while the eggplant (and tomatoes, if you choose) roasts. 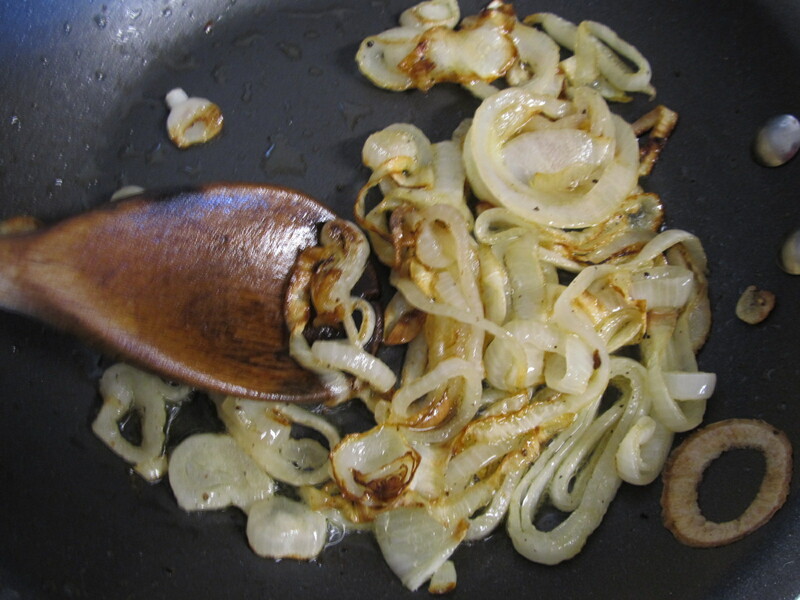 Meanwhile, caramelize an onion (see why I dedicated a whole post to caramelizing onions? We keep needing them!). While the onions, eggplant and tomatoes are doing their thing, mince a couple of cloves of garlic. 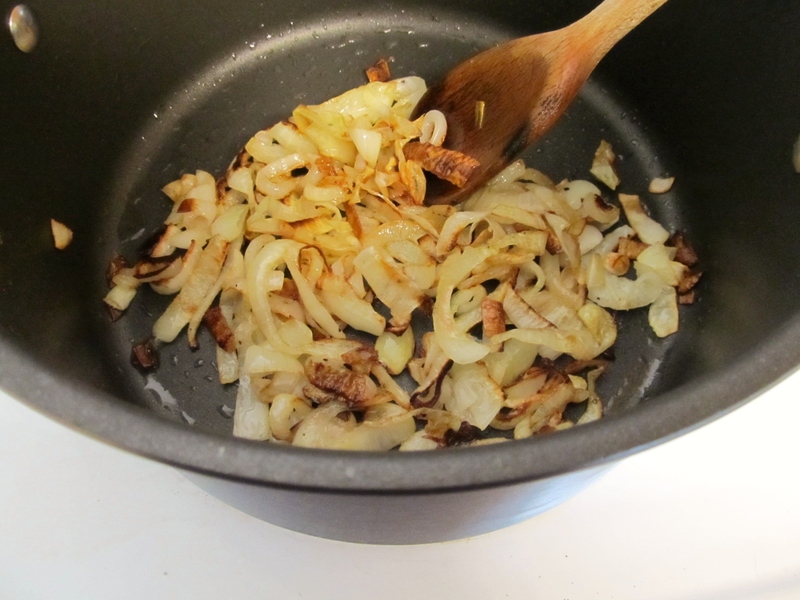 When the onions are ready, add the garlic and saute a minute, then deglaze the pan with a glug of vinegar – I used a red wine vinegar as I didn’t have a sherry vinegar as the original calls for. Next, add the canned or oven roasted tomatoes, the tomato paste, the roasted eggplant and a little bit of red pepper flakes. Stir and simmer on low. Add garlic, vinegar and tomatoes to the pan. Add the roasted eggplant to the pan and simmer. See those beautiful colors? At this point, if you haven’t already done so, you can put the pasta on to boil until al dente. 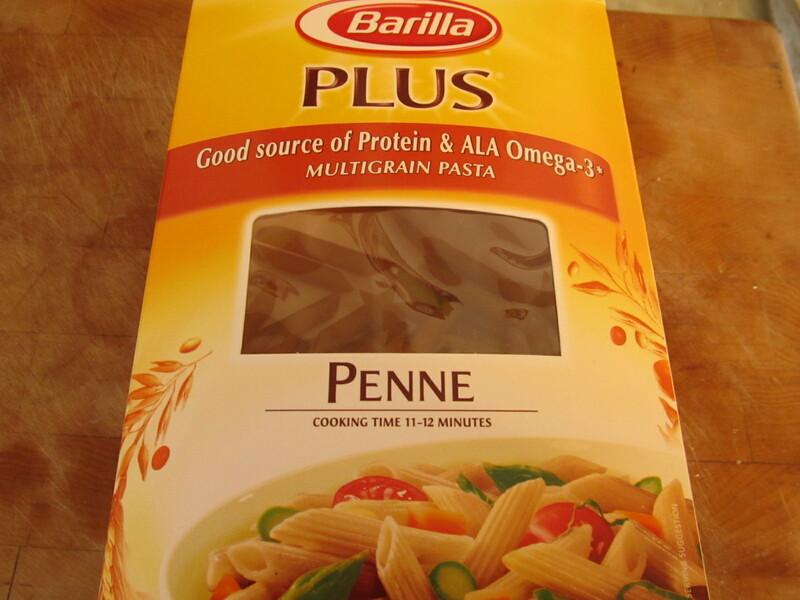 I used Barilla Plus penne, but you can use whatever type of pasta you have on hand. I like to let the sauce simmer for a bit so all of the flavors can meld, but you can simmer as long or as short as you have time for. I have actually turned it off, covered it and left it sitting for up to an hour at this point. Be sure to grab a few forkfuls to test, though. 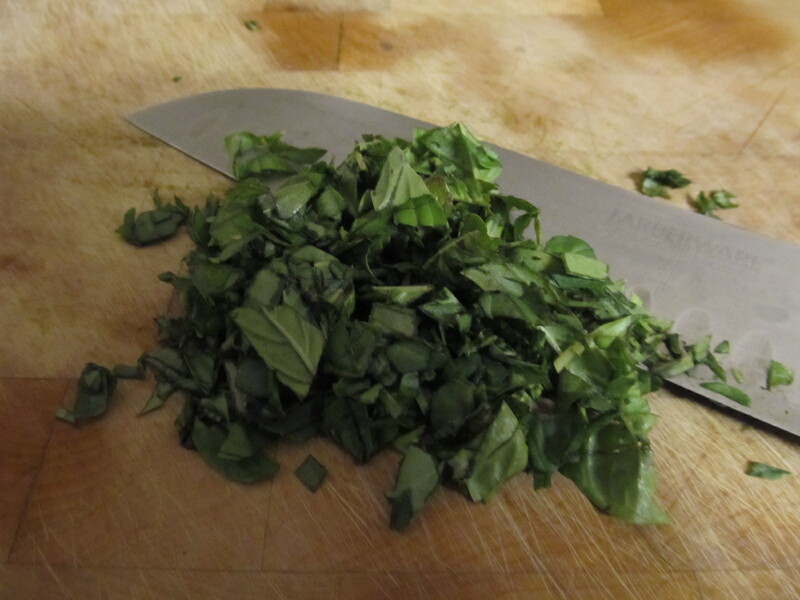 A few minutes before I’m ready to serve, I chop up a handful of fresh basil and add to pan. I’ve learned it’s better to wait until later in the cooking process to add the fresh spices. 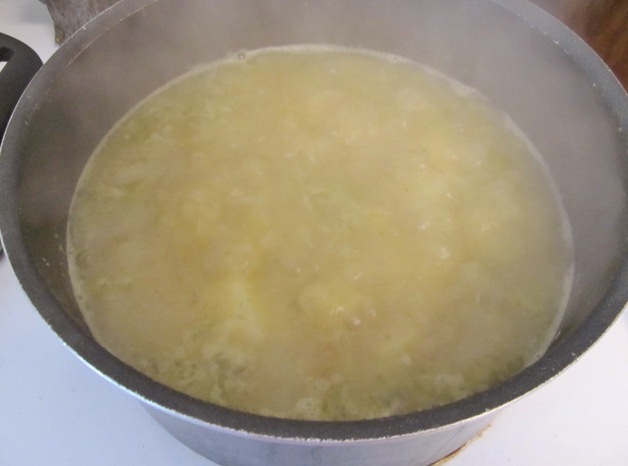 After adding basil, simmer a few more minutes and drain the pasta, reserving about 1/2 cup of the pasta water. It’s so pretty and smells sooo luscious! Finally, drain the pasta, reserving about 1/2 cup of the water in case the sauce needs to be a little more saucy. Add the pasta to the pan, fold in gently and serve immediately, or let it sit for a few minutes so the pasta soaks in some of the sauce. If your sauce is too thick for your taste, add the reserved pasta water, in small amounts until you reach the desired consistency. 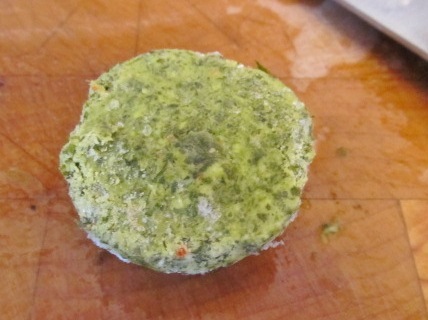 Serve and garnish with some grated Parmesan or Romano cheese, if desired. The first time I served this, the Hubs asked if it had meat in it. No. He sighed…a meatless meal. Again. Then he dug in and devoured two helpings. In fact, we ate ALL OF IT that night. We stopped short of licking the pan. If you’re leery about eggplant, it’s ok. It doesn’t taste eggplanty at all. It’s just thick and rich and binds all of the other yummies together. I swear, if you make this for your next dinner party, you will be the next Martha Stewart Rachael Ray of the neighborhood! 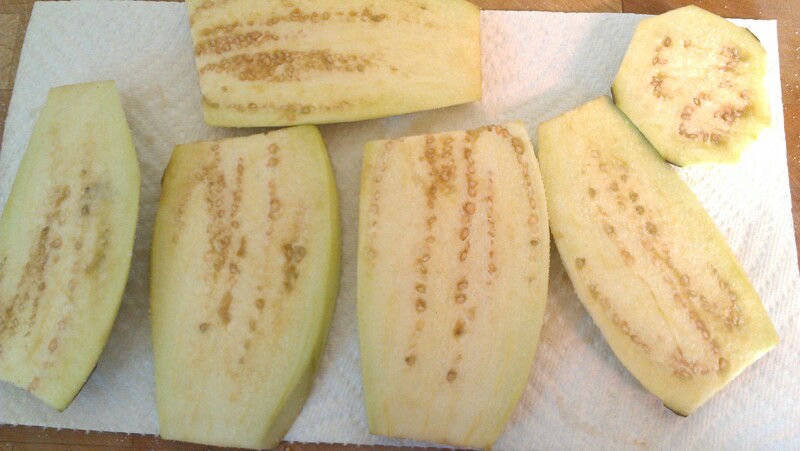 Peel and slice eggplant into 1/2″ planks. Salt generously on both sides, then lay out on towels to drain for 30 minutes, flipping halfway through. 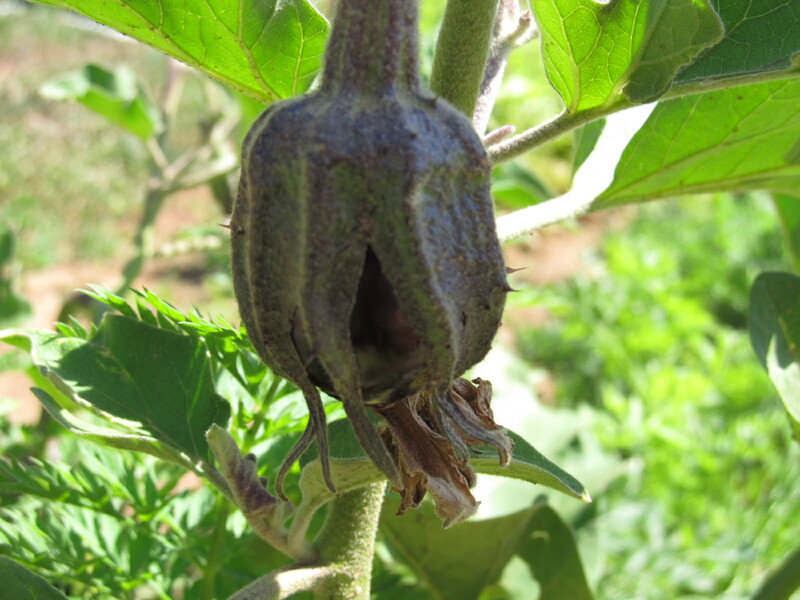 If your eggplant is garden fresh, you should be safe to skip this step. 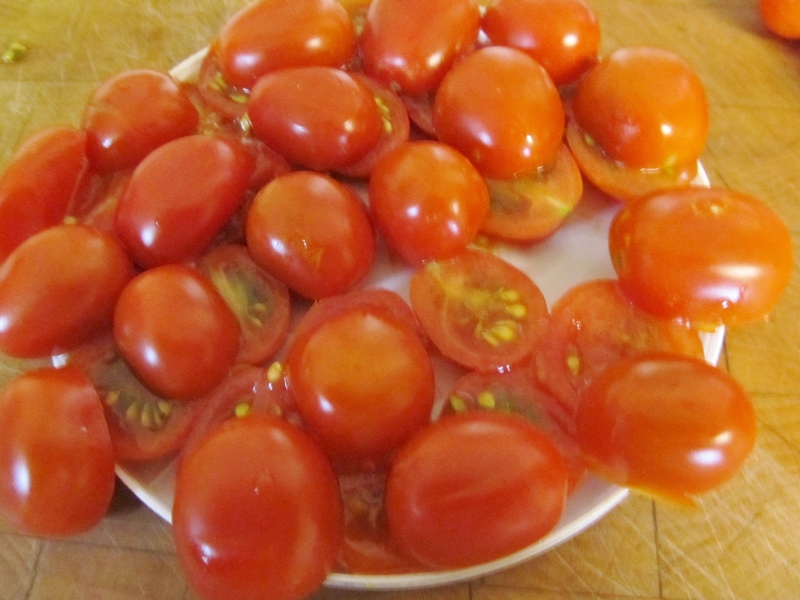 If using the roasted cherry tomato recipe, prepare tomatoes while eggplant is draining. Wipe the salt off the sliced eggplant, then dice. Place on un-greased baking pan. Roast for 20-30 minutes until tender and golden brown. If roasting tomatoes, place in oven at the same time as eggplant. They should finish about the same time. 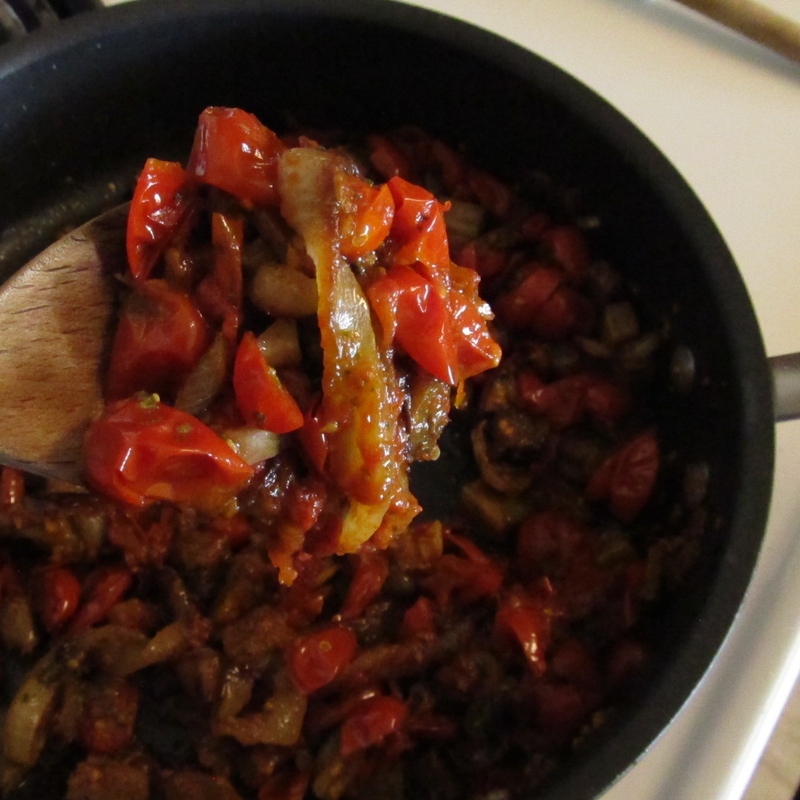 While eggplant and tomatoes roast, caramelize onions in a large, deep saute pan. 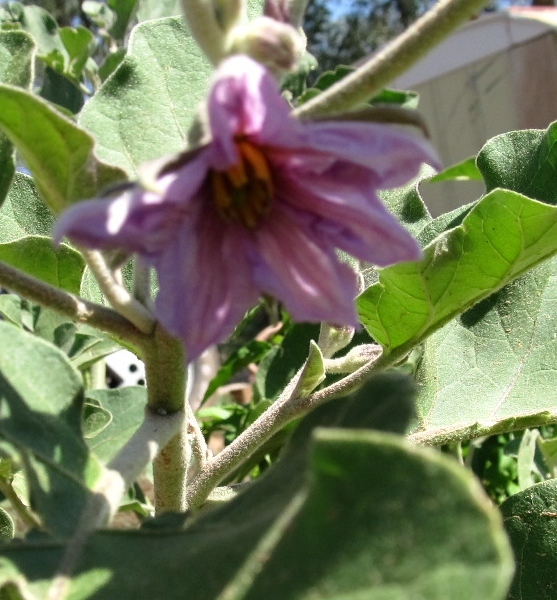 The onions, tomatoes and eggplant should all be ready about the same time. When onions are caramelized, add garlic and saute for a minute before deglazing by splashing the vinegar or wine into the pan. Add tomatoes (canned or roasted) and paste to pan and simmer for a few minutes on low-medium heat. Fold in roasted eggplant and red pepper flakes. Salt and pepper to taste. Continue to simmer on a low heat. Chop the basil and add to sauce a few minutes before serving. Add pasta to sauce, stir gently. 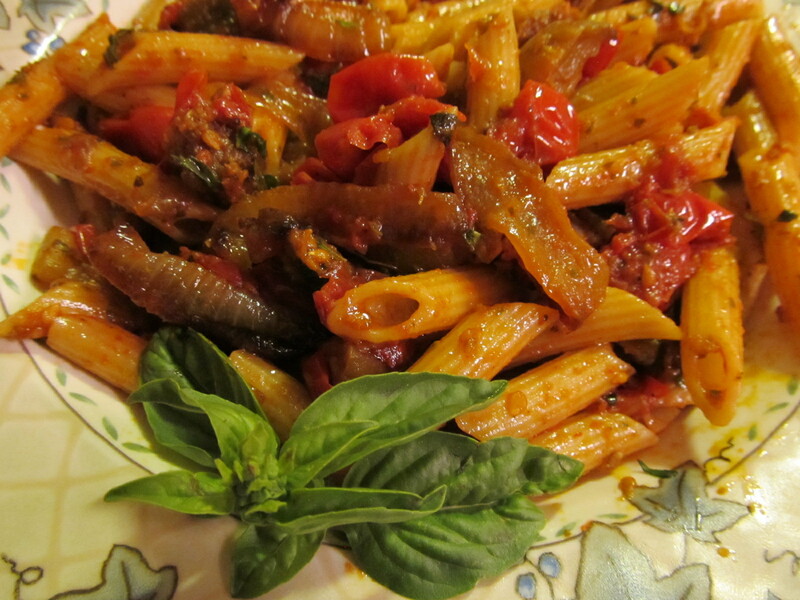 Add reserved pasta water a spoonful at a time, to create a saucier sauce, if desired. Let simmer on low for a few minutes or serve. Notes for next time: Honestly, this is one recipe that I plan to leave alone. I’m always tempted to add more ingredients – like I think it might be nice to add some zucchini to this (since we have plenty), but I am going to refrain and not mess with success since this is so perfect, as is. The Hubs loved it just as much when I made it again and thinks we should grow even more eggplant next year. Since I’m still drowning in the eggplant harvest, I wonder if I could make this sauce and then freeze it. 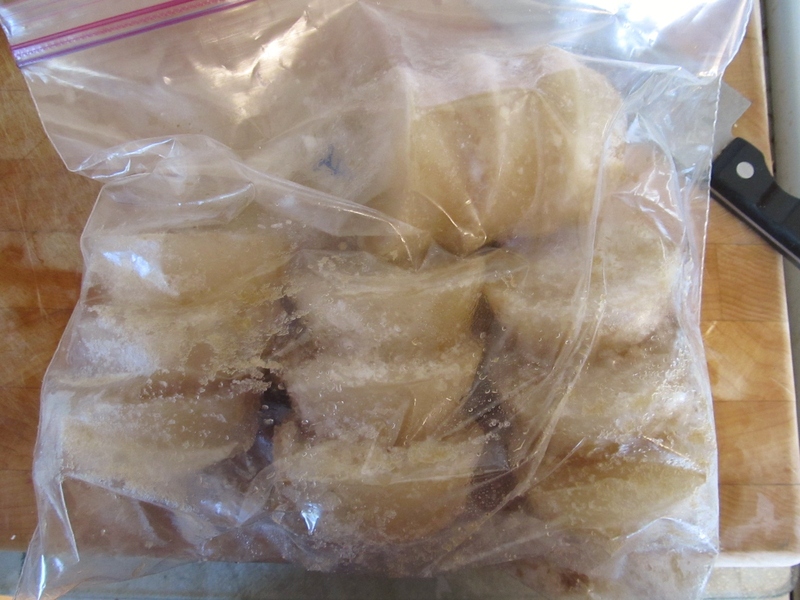 I have baked and frozen some eggplant for winter use, but hadn’t though of freezing it. Might give that a whirl! 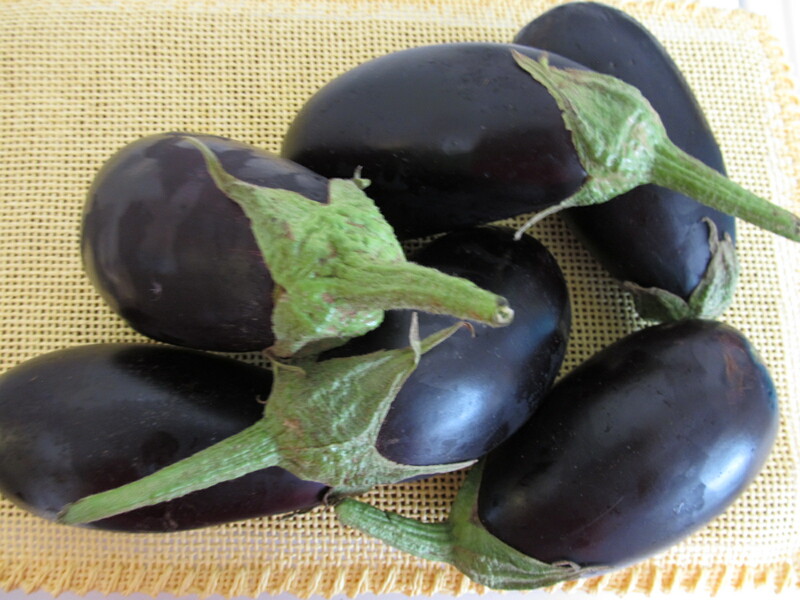 For more eggplant recipes, see my Eggplant Board on Pinterest. Categories: Cooking, Dinner, Garden, Pasta, Veggies | Tags: Cooking, eggplant, food, healthy, pasta, Roasted cherry tomatoes, Vegetarian | Permalink. UPDATED: See bottom of post. This year I planted tomatoes for the first time. I had planned to only have three plants because I wasn’t convinced that I would enjoy growing them – or be successful. Since I didn’t know a lot about the many plant choices, I ordered a variety pack from Burpees. One of those was called the Super Sweet 100 Hybrid, described as a high-producing sweet cherry variety. Then a friend gave me a couple of additional plants, which turned out to be cherry varieties, as well. So, out of five plants, I have three that are cherry! Know what that means? I have MILLIONS of itty bitties, and I wasn’t prepared for the influx of the little sweeties. 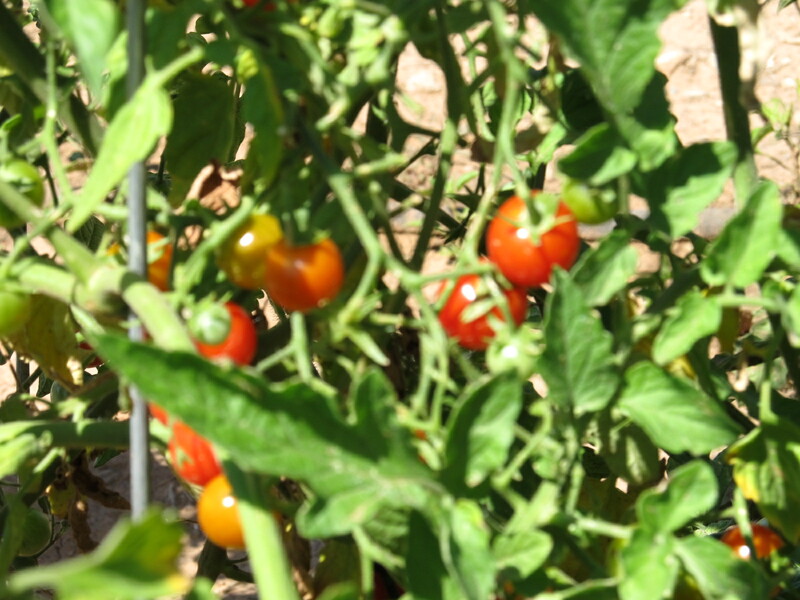 Cherry tomato plants produce MILLIONS of sweet little tomatoes! 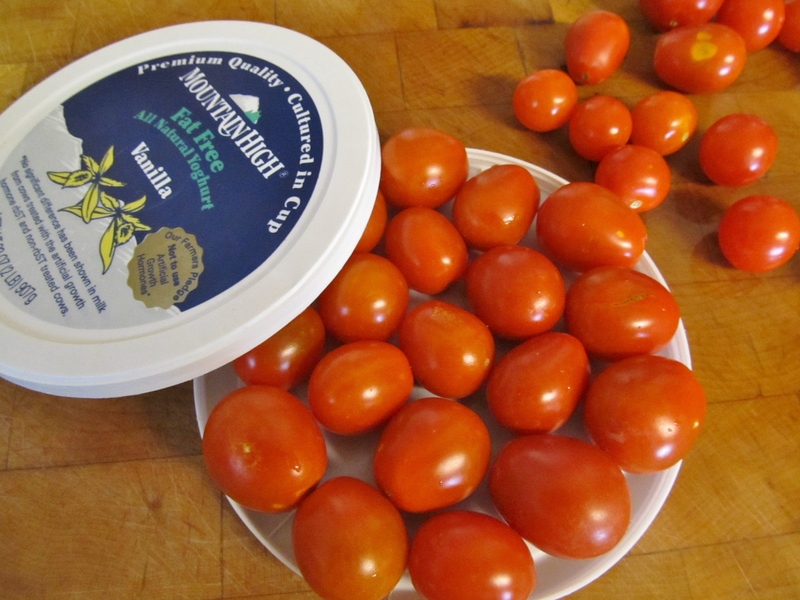 I started exploring other food blogs to figure out how to preserve the giant harvest of mini tomatoes and learned that while it is possible to can them, most people don’t because most people don’t like to leave the skin on canned tomatoes and most people refuse to peel 1000 cherry tomatoes in order to get a couple of pints of canned tomatoes. Personally, I’m not terribly averse to skins and I do throw some cherry maters in my salsa, but decided I wanted to do something else with the little guys since I’m canning the big ‘uns. What to do with all of those little yummies? 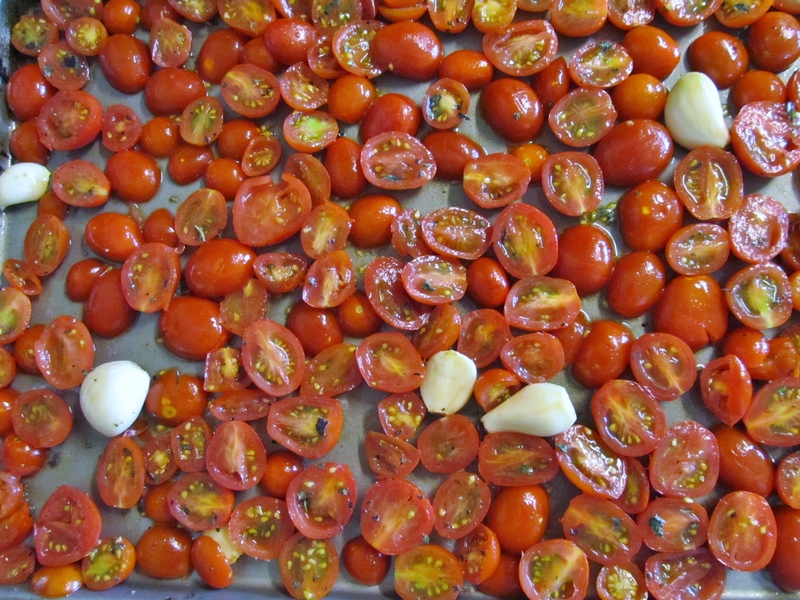 I learned a simple, fast and super yummy trick for roasting and then preserving cherry tomatoes. I’ve seen several versions of this technique, so I am by no means claiming to have thought of it myself! As always, I try to put a little of my own spin on it and show you how easy this savory delight is to make and how versatile the finished product can be. I started with about a pound of cherry tomatoes, which fits in one jelly roll pan and makes about one half pint of the mixture. I only have one jelly roll pan so that’s all I make at a time – you could make more if you have multiple pans. Preheat the oven to about 425 degrees. Prepare the tomatoes by slicing each of them in half. TEDIOUS! I hate tedious! Let’s make this faster. I wish I remember where I saw this trick (somewhere on Pinterest, I’m sure), but the person who invented it is a genius. Here’s what you do: find two plastic lids of the same size. I use the kind from the big Greek yogurt containers (cottage cheese, sour cream, etc.). Set one lid, label side down and fill the lid with tomatoes. I find it works best if you use similar sized tomatoes in each batch. 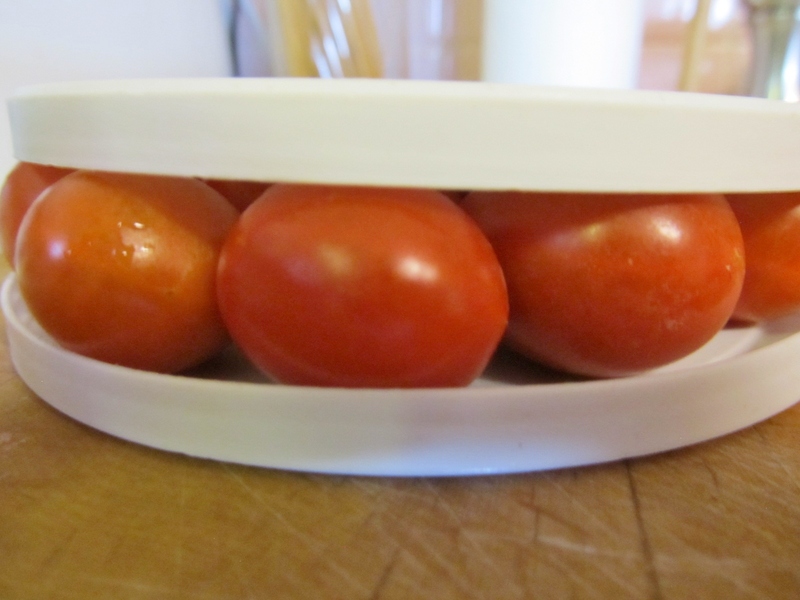 Fit them in as snugly as you can, then place the other lid, label side facing up on top of the tomatoes, making a little tomato sandwich. 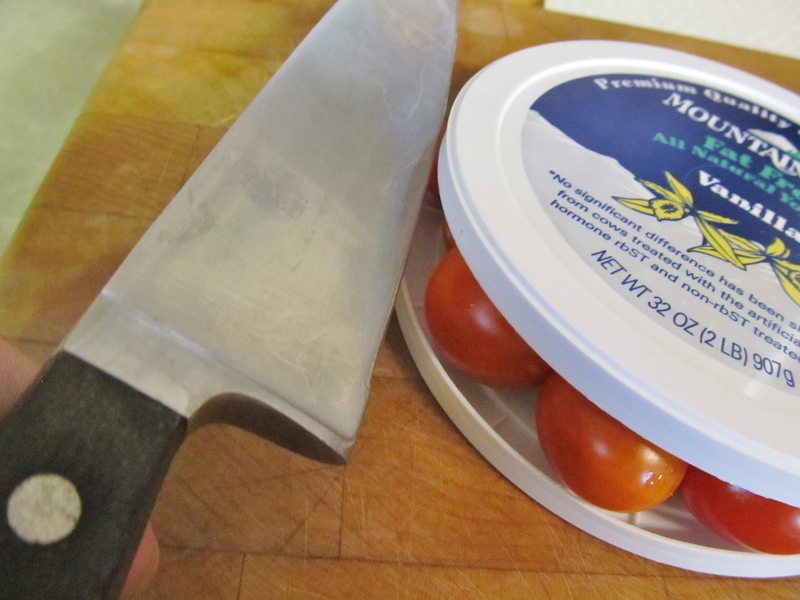 Now, press down on the sandwich firmly and begin slicing into the tomatoes with an very sharp knife. If you don’t keep the pressure firm, the tomatoes will escape out the backside of the sandwich. Sometimes I do rotate it a bit, but do not pull out the knife, which would make it messy. Viola! Quick work made of slicing up a handful of cherry tomatoes! I told you it was genius! Like magic, they’re all sliced in one move! 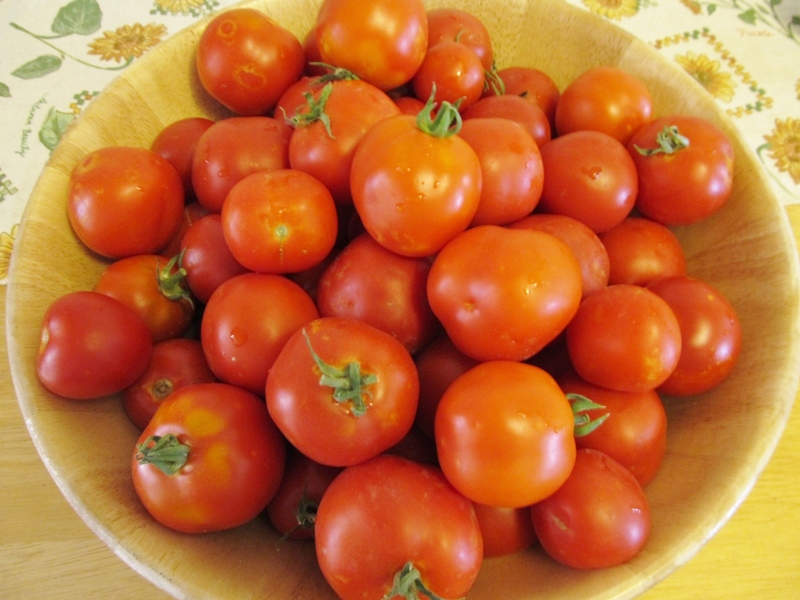 After the tomatoes are halved, place them in a medium sized bowl. 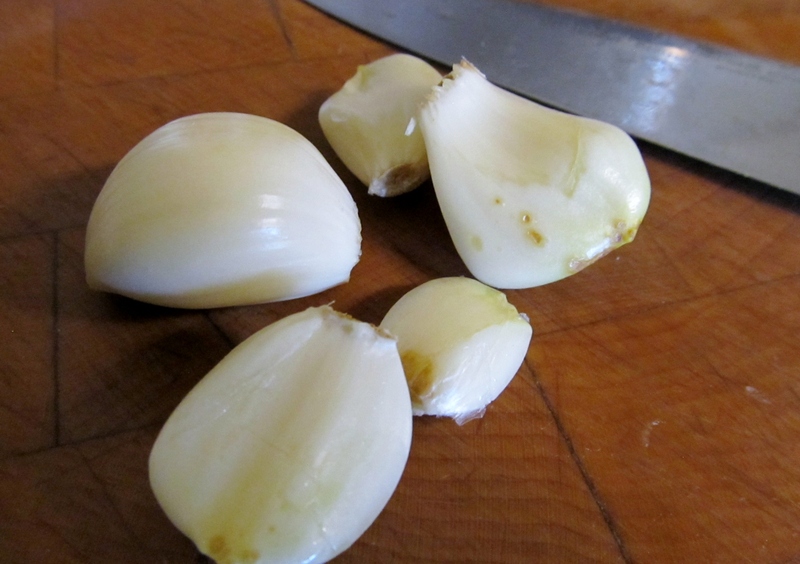 Peel, but do not chop a few cloves of garlic and add to the bowl of tomatoes. Remember that garlic mellows out when roasted, so feel free to add more! 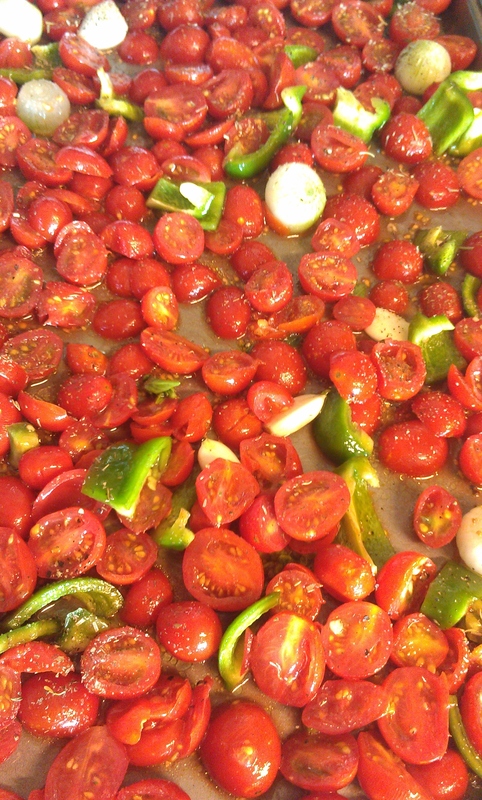 Add about a 1/4 cup of EVOO to the bowl and gently stir to coat all tomatoes and garlic cloves. 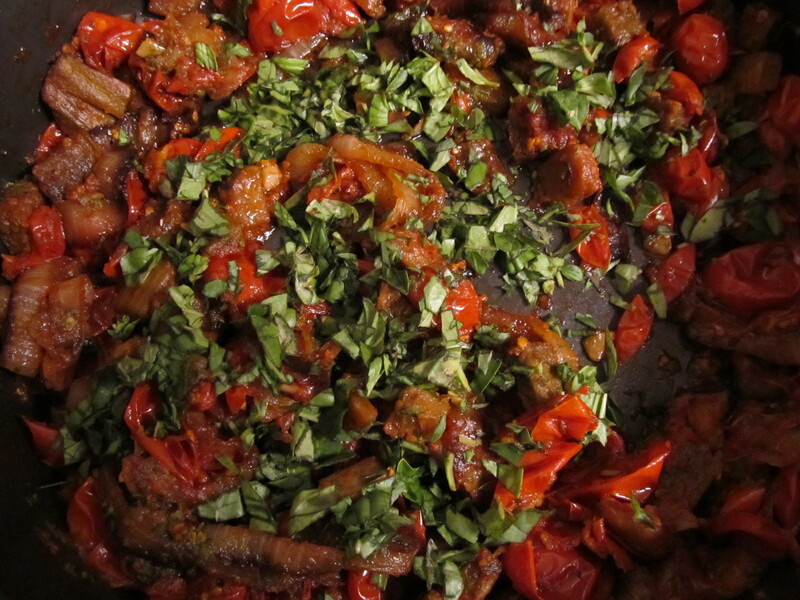 Dump the contents of the bowl onto the pan and spread the tomatoes and garlic out into a single layer. It doesn’t matter if the tomatoes sit cut side up or down. Sprinkle the spices and salt and pepper over the mixture and place in the oven. Roast for about 20-30 minutes. I like a little charring on the edges, so I wait until I see that before I pull them out. Be careful, though, because you can go from a little char to a major scorch in a matter of a minutes. My pan below may have gone a little too long. Let the mixture cool on the pan. The second they are cool enough to eat, taste them! (Caution: I have burned my tongue more than once by diving in too soon!). Amazingness, right? Super savory flavors that make you want to lap it up off the pan. Depending on how much you eat off the pan, you now have a nice little batch of roasted yummies to add to tonight’s dinner, or save in a jar for a future recipe. If I want to save them for another day, I scoop the mixture into a half pint (jelly size) jar. Be sure to get all of the drippings and the garlic (you can smash or chop the garlic to make for easier use later). Smoosh the mixture firmly into the jar and top with a splash of EVOO. Fill to nearly the top, but f you’re going to freeze it, leave about 1/2″ headroom. I have kept the mixture in the fridge for up to a week, but if I don’t think I’m going to use it quickly enough, I just pop it in the freezer. Defrost in the fridge overnight when ready to use. The mixture makes a perfect pasta topping, as is. 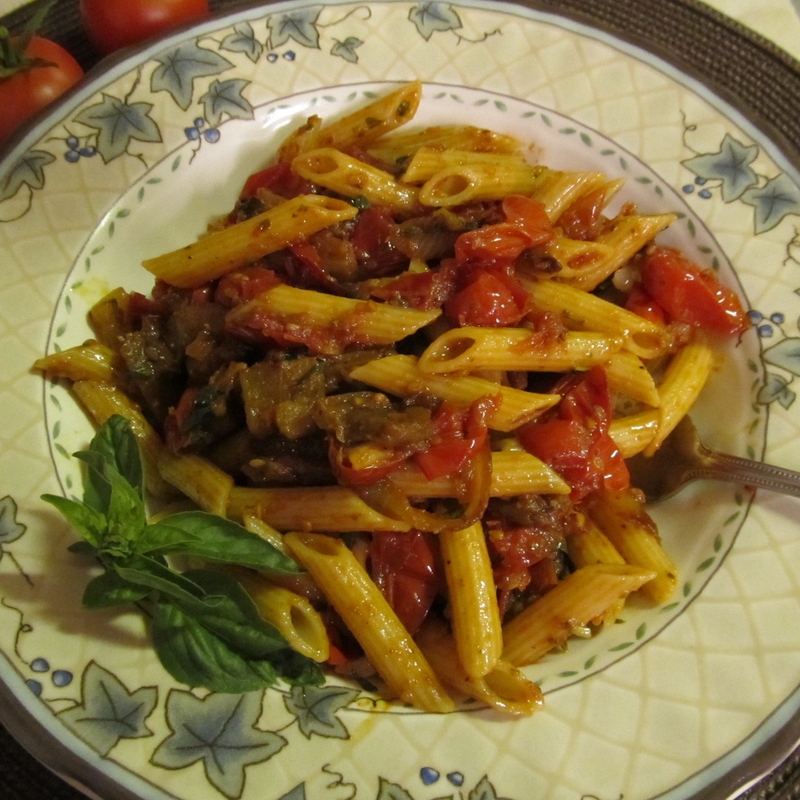 Just prepare some pasta, warm the tomato mixture in a saute pan (add some pesto and/or a little tomato paste for more body) and then combine the pasta and tomato mixture for a super easy, but very savory supper. I will share my FAVORITE pasta dish with you in a future post soon, and we’ll use this recipe as our basic sauce starter. Besides pasta, you could use this as a topping or stir it into many other dishes since it’s just a tomato and garlic combo. Think: stews and soups, stir into meatloaf or burgers, cassaroles, bruschetta, pizza, eggs, rice, veggie stir-fries, shrimp or fish topping, bean or green salads, etc. It also occurs to me that it could be pureed to create a smoother texture, making it even more versatile. Oooo…gotta try that! Slice tomatoes in half, place in medium-sized bowl. Peel garlic, add to bowl with tomatoes. Add EVOO to bowl, gently stir to coat all tomatoes and garlic. Pour mixture onto jelly roll (rimmed baking sheet), spreading mixture into single layer. 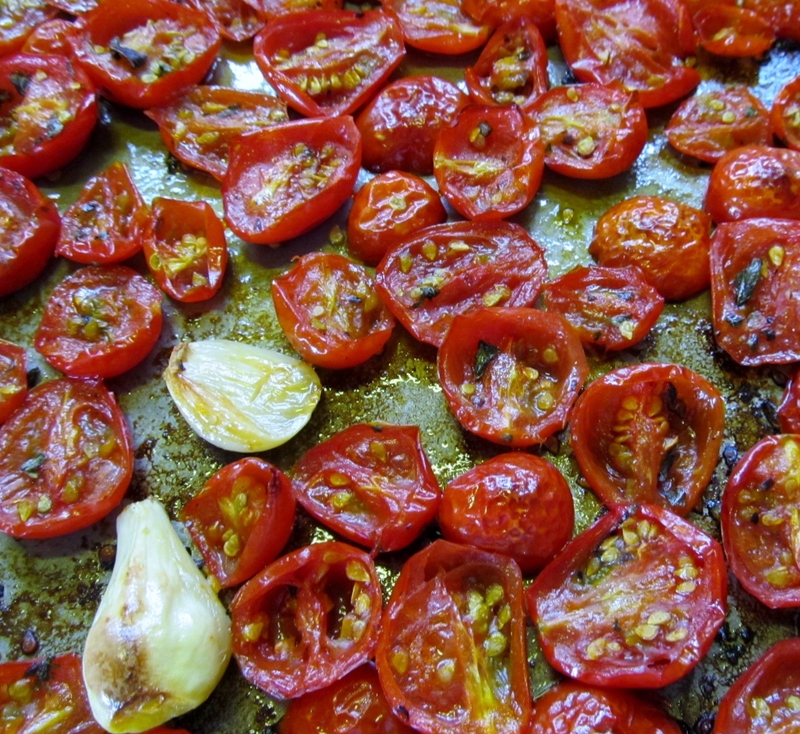 Roast for 20-30 minutes, until edges of tomatoes are slightly charred. Remove from oven. Cool completely on the pan. 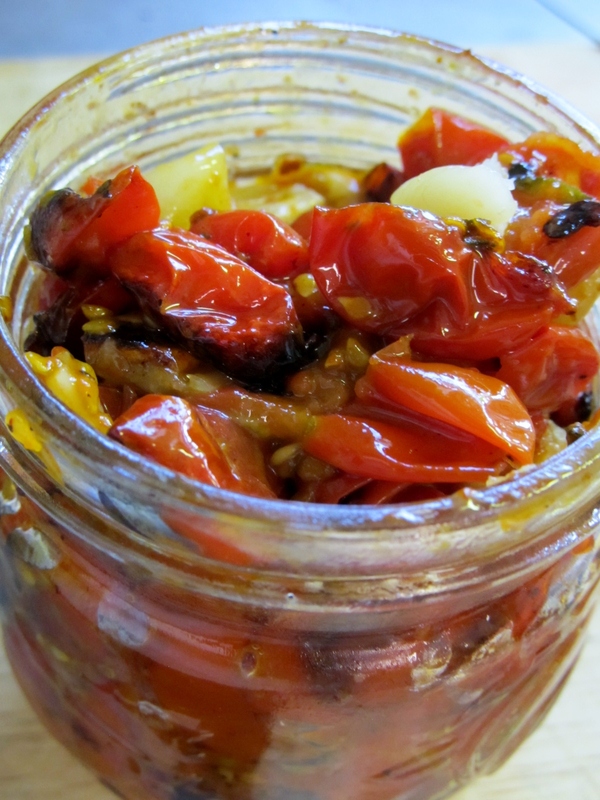 Use immediately, or scoop mixture into small jar, packing tightly and topping with EVOO. Leave 1/2″ head space if you plan to freeze. I think it would be fun to try a Mexican spin on the mixture by using Mexican spices instead of Italian and adding some green chiles or jalapenos to the roasting pan. 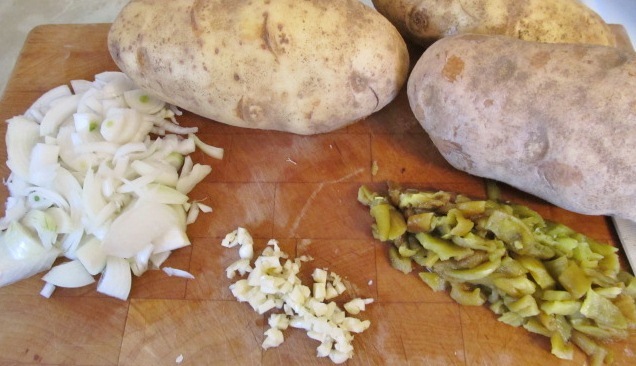 This version could be used as a stir-in to taco filling and other Mexican dishes. Another nice addition to either version would be thick slices of onions and/or green peppers which also roast so nicely and pair well with tomatoes. 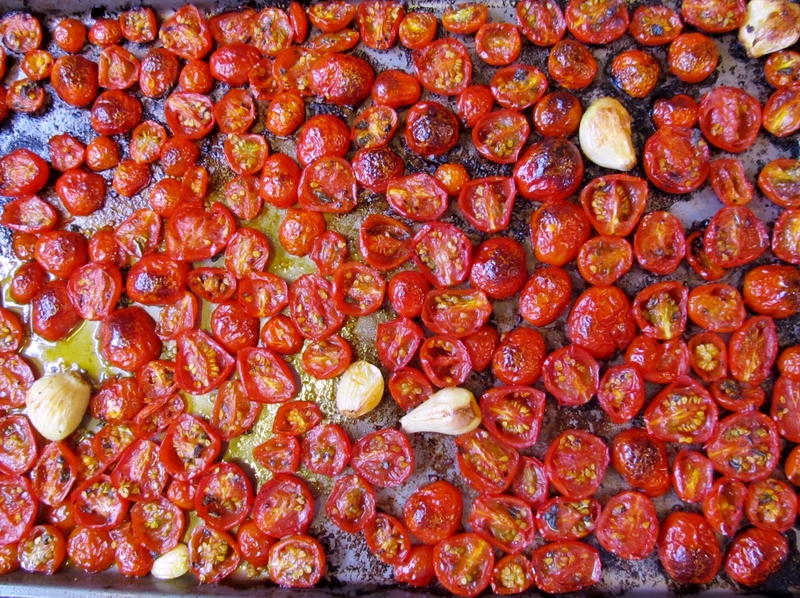 Leave a comment with your roasted tomato recipe ideas. Enjoy! 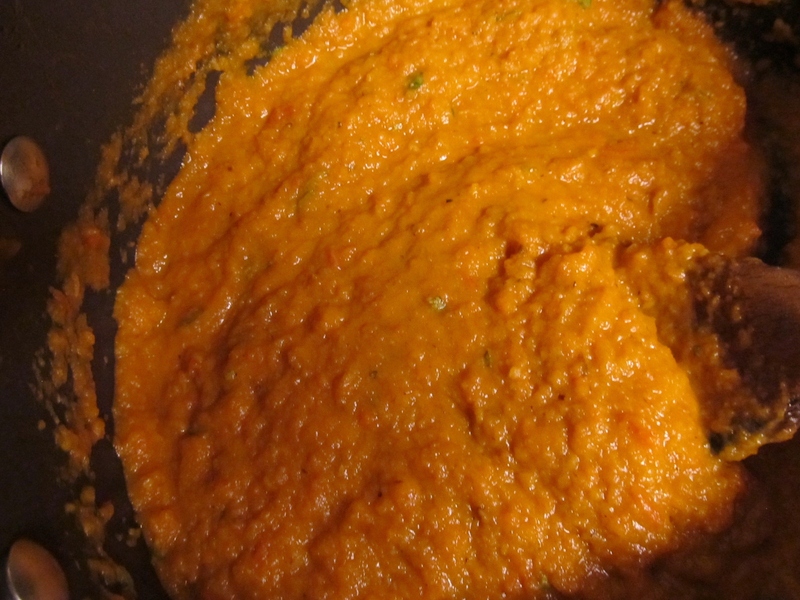 When I wrote this post, I noted that maybe the roasted tomato mixture could be pureed into a smoother texture, making it even more versatile. I also thought it would be fun to add some onions and bell peppers to the roasting pan to include even more savory flavor. Well! Last night I tried both and it turned out to be simply delicious and got rave reviews from the Hubs. He isn’t quite as enamored with the texture of the plain roasted tomato mixture as I am, so the smoother version works great for him. I just had to share! 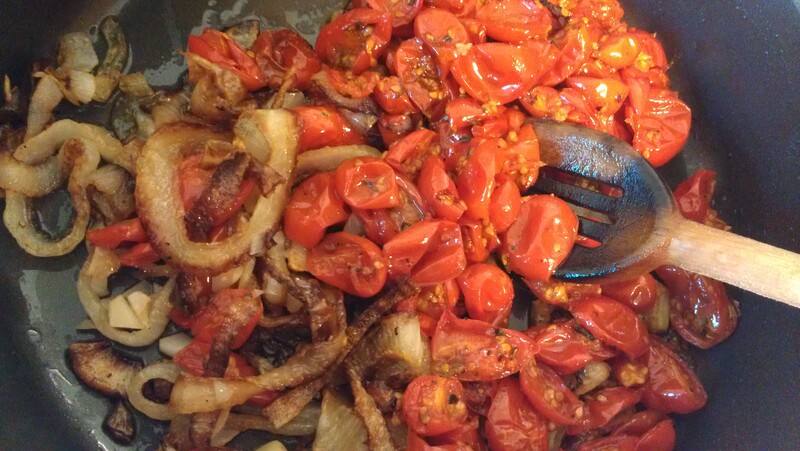 Prepare cherry tomatoes and garlic as above, but add chopped pieces of bell pepper and onions. I had some pearl onions (over-grown green onions) from the garden, so I used those. You can just chunk up about half an onion. 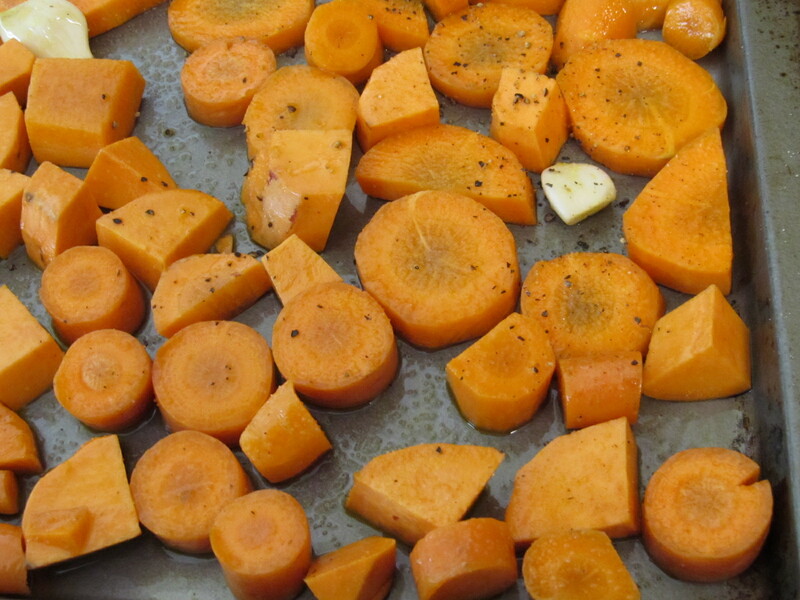 Toss with olive oil, as described above and roast the same way. Next, dump the mixture into a bowl and use the immersion blender to puree to the desired consistency (or cool then use a food processor or blender). 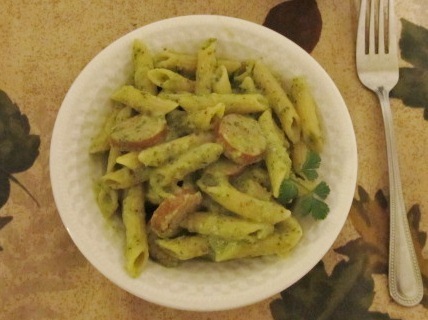 I added a dollop of my basil pesto, a little salt and pepper and about 1 Tbsp of sugar, but mostly because I was experimenting with the flavors. It was great, as is, before adding ingredients. Just tweak to your own tastes and you end up with great marinara sauce. I served mine over open-faced (chicken) meatball sandwiches and the Hubs asked for seconds. Enjoy! Categories: Cooking, Dinner, Garden, Preserving, Veggies | Tags: basil, Bountiful Baskets, Canning, Canning Tomatoes, Cherry Tomatoes, Cooking, Diced Tomatoes, easy, food, freezing, Fresh, Garden, gardening, garlic, Grow, healthy, homemade, ingredients, Italian, low-carb, low-fat, Mexican, onions, pasta, peppers, preserving, recipes, Roasted cherry tomatoes, roasting, savory, simple, Tomato plants, tomatoes, vegetables | Permalink.